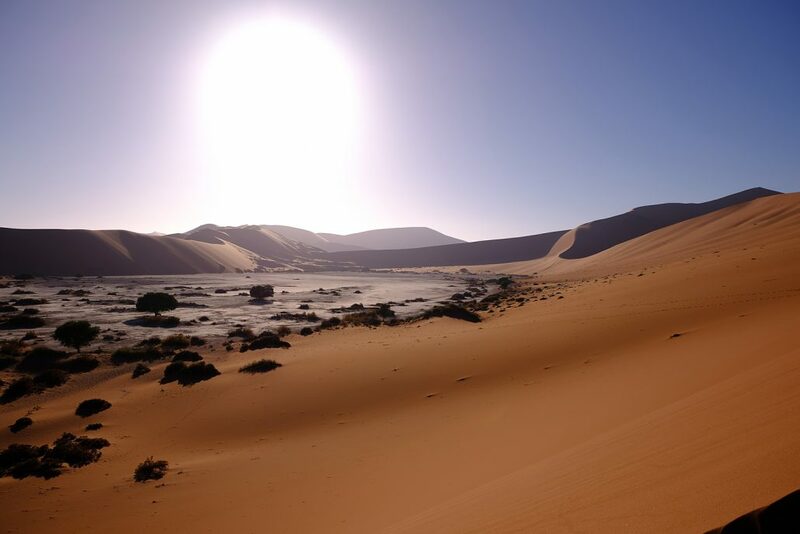 Today, the day before Christmas Eve, is a very special day on our tour around Southern Africa: we will immigrate to Namibia. It doesn’t take too long at the immigration office to get our 90 days tourist visa stamped into our passports and get our road fee paid. 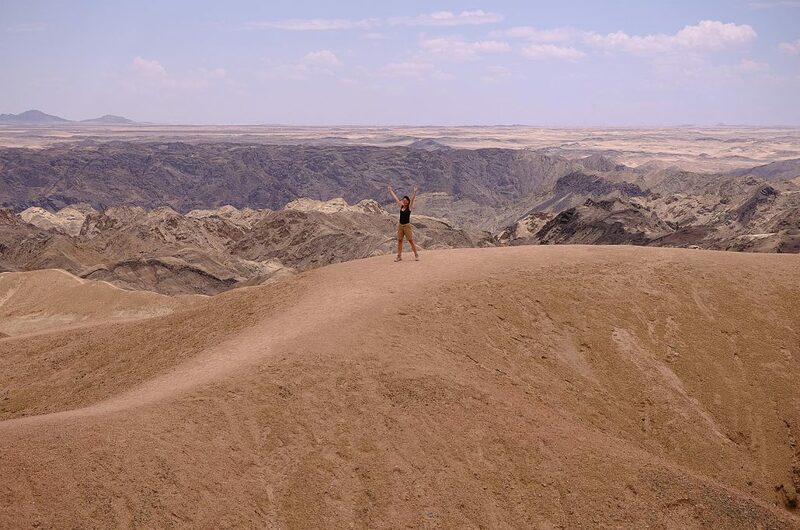 Welcome to Namibia! 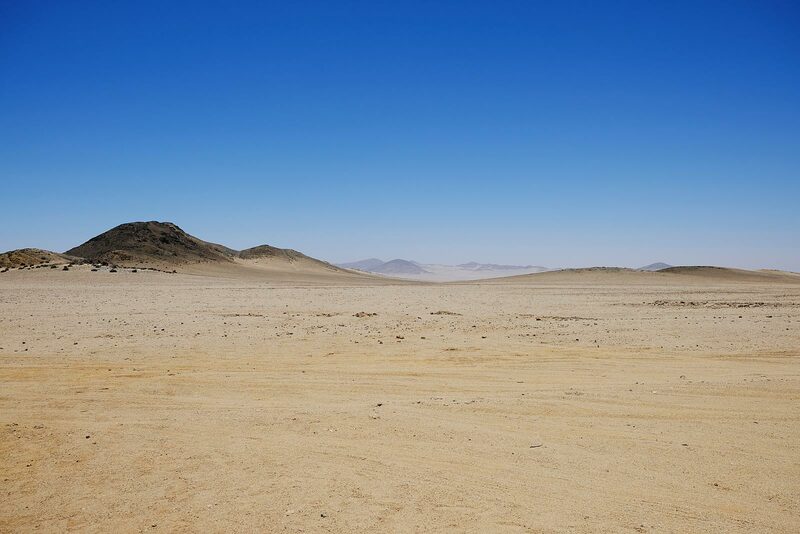 Namibia, you great unknown. We already know quite a few things about you but still have absolutely no idea what you are like. We’re very curious about you. We arrive at Ai-Ais, the hot springs, and turn Christmas Eve into a lazy wellness adventure. We stretch out contentedly in the 35 °C hot thermal water, and it’s hard to say, which one is hotter, outside temperature or water temperature. Hot water gushes forth from a geothermal spring with a temperature of 65 °C and the sun is burning.. In the evening the heat of the day is gone and we enjoy crispy cool wine at the camp fire and listen to festive jazz music. It feels very solemn even without a decorated Christmas tree. 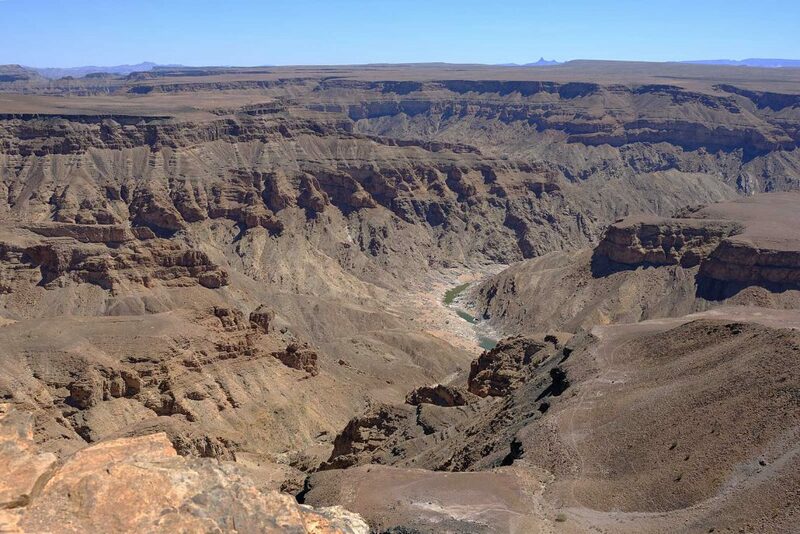 The next day we shake ourselves from Ai-Ais to Hobas to the sublime Fish River Canyon on wide, mortal corrugated gravel tracks. 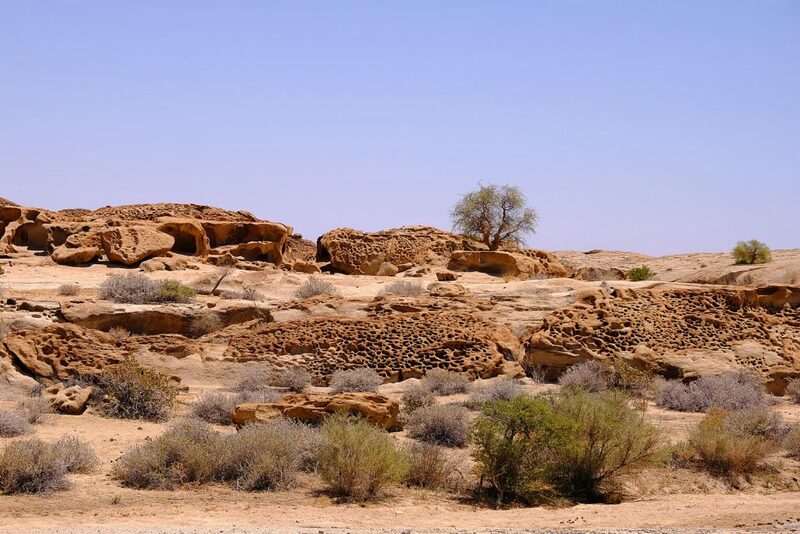 At Hobas there is the north entrance to an 86 kilometre trail you can hike within four or five days. 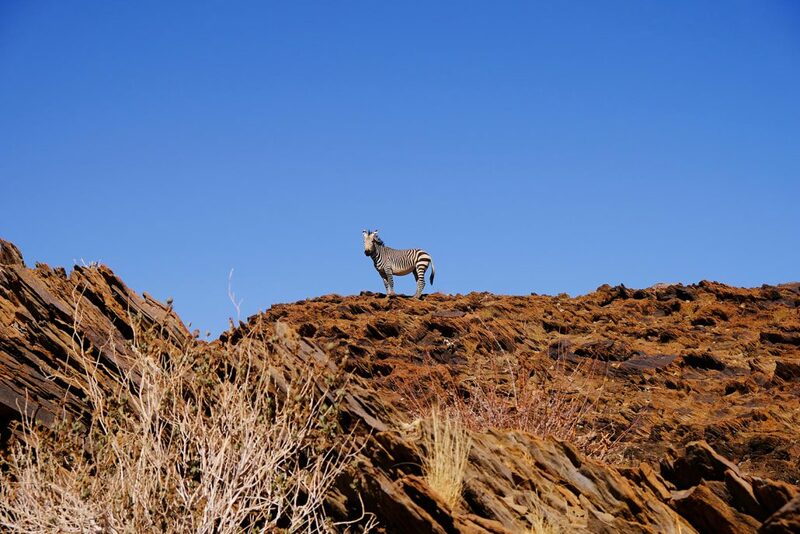 It’s only allowed if you are in a good physical shape, with a permit from NRW Namibia Wildlife Resorts, in groups of minimum three people and only during winter time from May, 1 to September, 15. Climbing down the canyon just for a quick walk is prohibited. 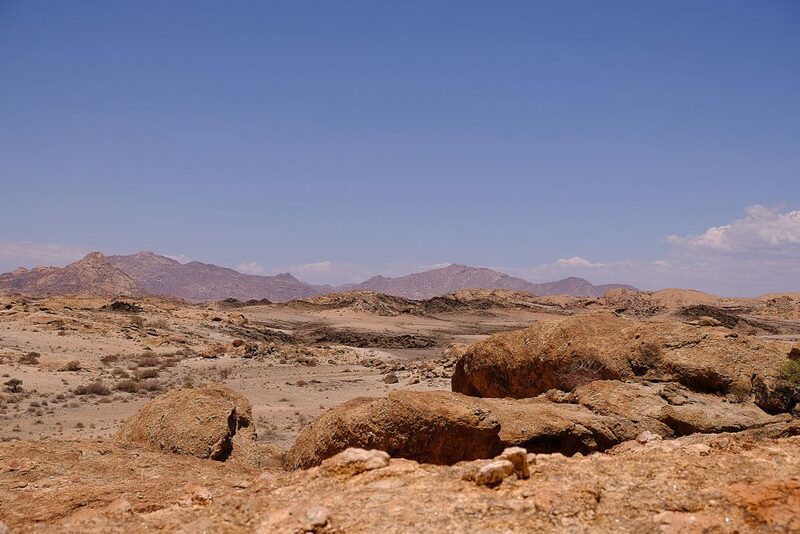 During summer time temperatures can rise up to 50 °C at noon. Of course a hiking tour would be a cakewalk for us, but “unfortunately” it’s summer and by law not allowed. Lucky we are! 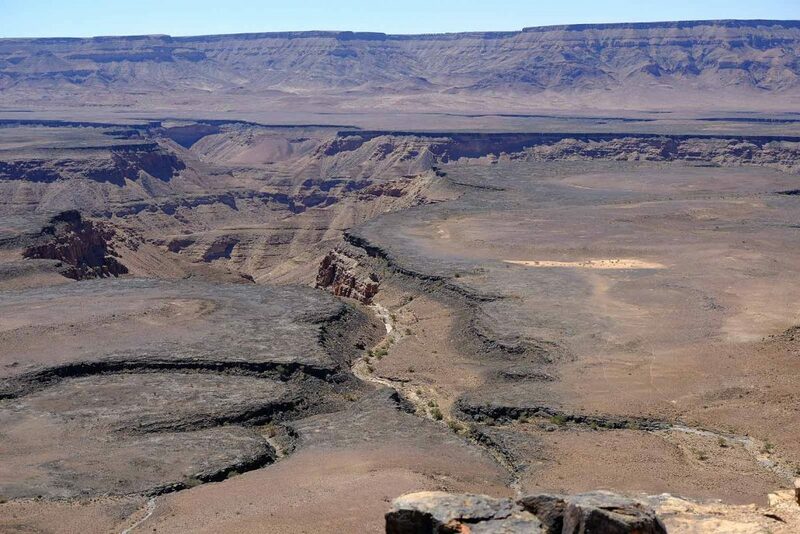 The panorama of the wide canyon with it’s dark stone majestically lies in front of us. There is absolutely no noise apart of the whisper of the wind. The intangible dimensions and the total solitude are fascinating and formidable at the same time. 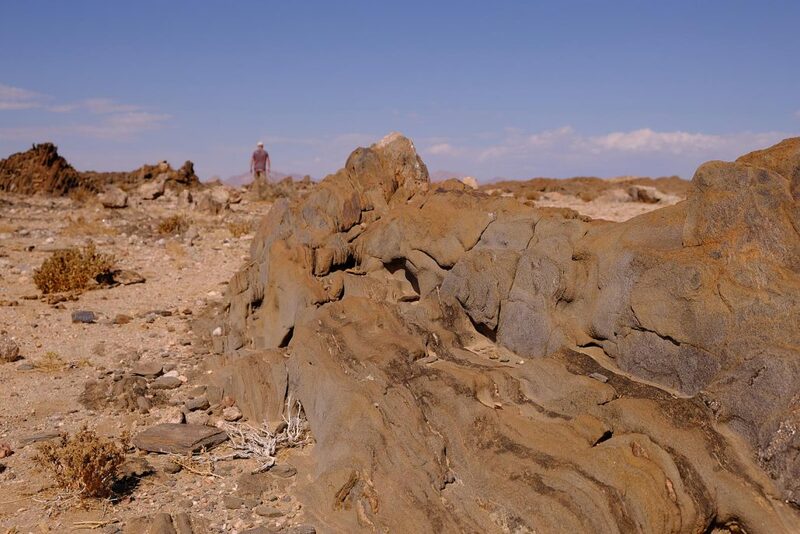 Bone-dry heat, stones as far as the eye can reach and not a soul to be seen. The river far down there carries only a little water, therefore there is no rush to hear. 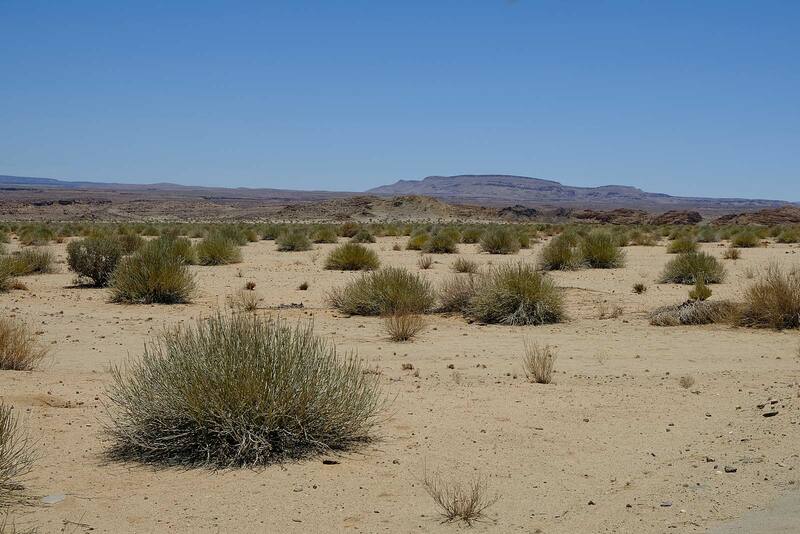 This area is also the home of the black thick-tailed scorpion (hairy and venomous!). Win would love to meet one, if it is not in his shoes. 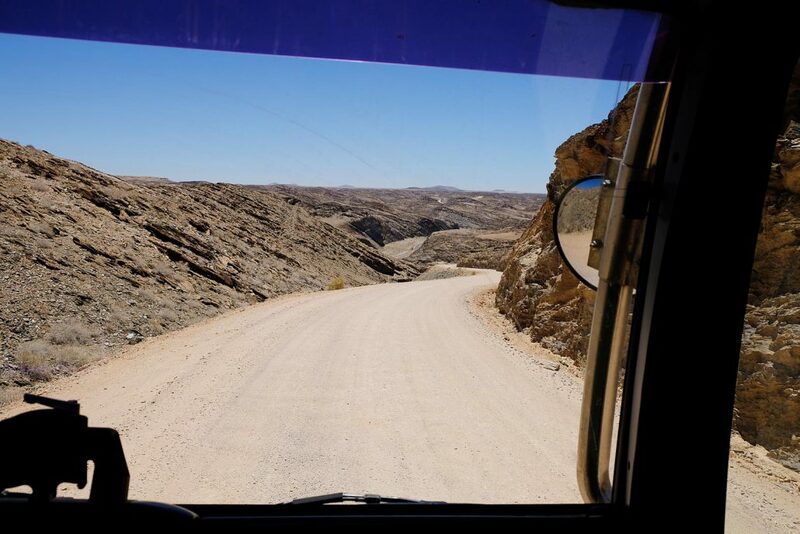 After our visit at the canyon we significantly increase our cruising speed and adjust it to the corrugated gravel tracks. Et voilà! – it doesn’t bother anymore and we speedily make progress. Landscape may be beautiful but in the long run also a little bit monotonous. 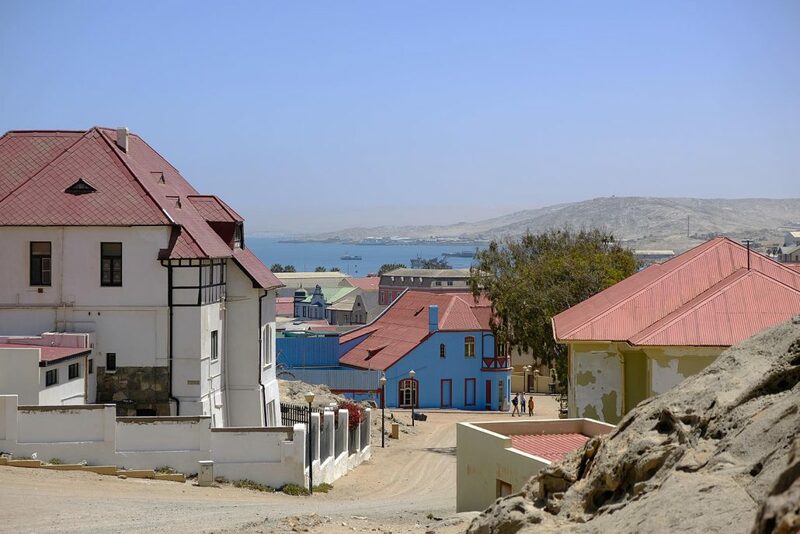 In the famous coastal town Lüderitz, also called !Nami=Nûs since 2013, we come upon German history. At the time it required plenty of optimism, bravery and pioneering spirit, to make one’s home in this area at the Atlantic Ocean, that is as much hostile to life. Franz A. E. von Lüderitz, a merchant from Bremen, obviously had the entrepreneurial spirit and the wherewithal to break the first ground. Many Germans followed but not until 1908 with the beginning of the diamond boom. Even today you can find the Reichsapotheke or the Kirchweg hier and above the Entrance to the library it says Lesehalle in capital letters. 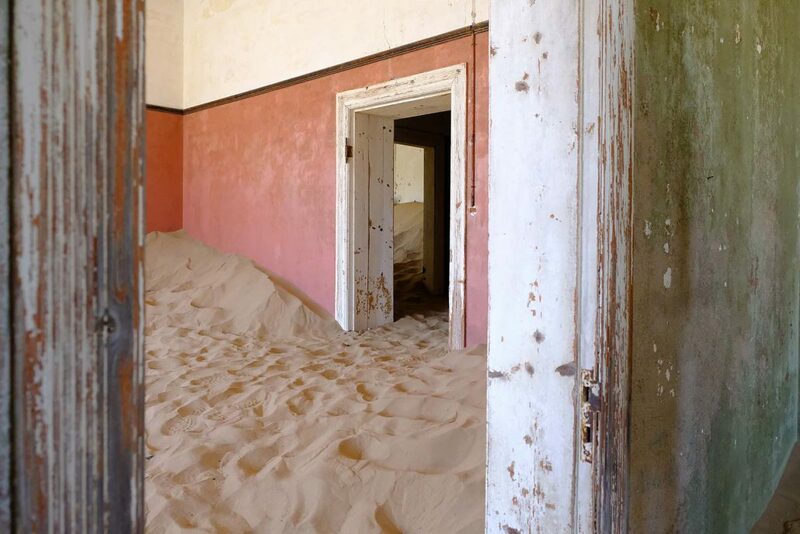 When it’s stormy, as it is mostly the case, the desert sand whirls around the streets of the town. We are lucky and enjoy a light breeze blowing from the sea today. 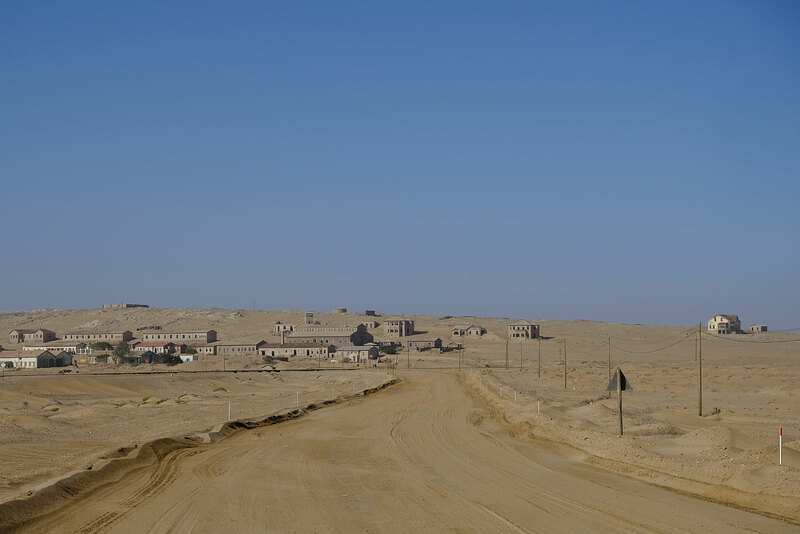 Some kilometres inland sun is burning down on the dust-dry landscape and makes us sweat. There is no light breeze left anymore. 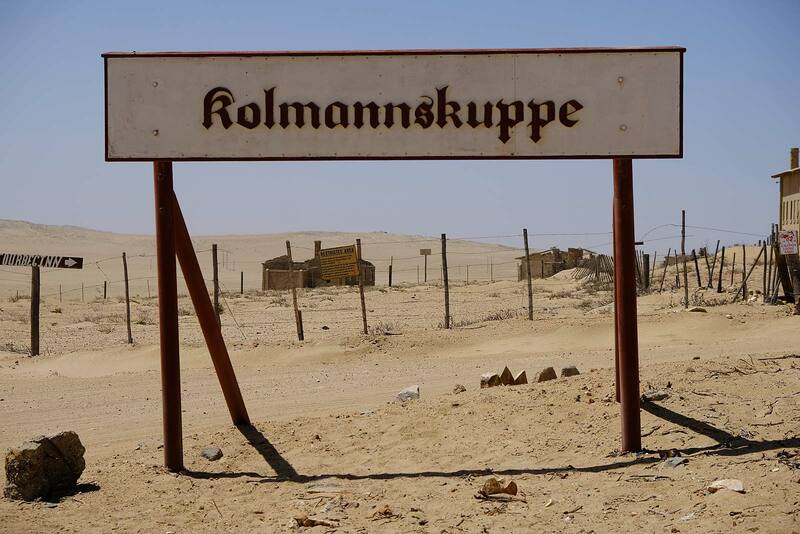 We are at Kohlmannskuppe, the hotspot of diamond mining until 1930. 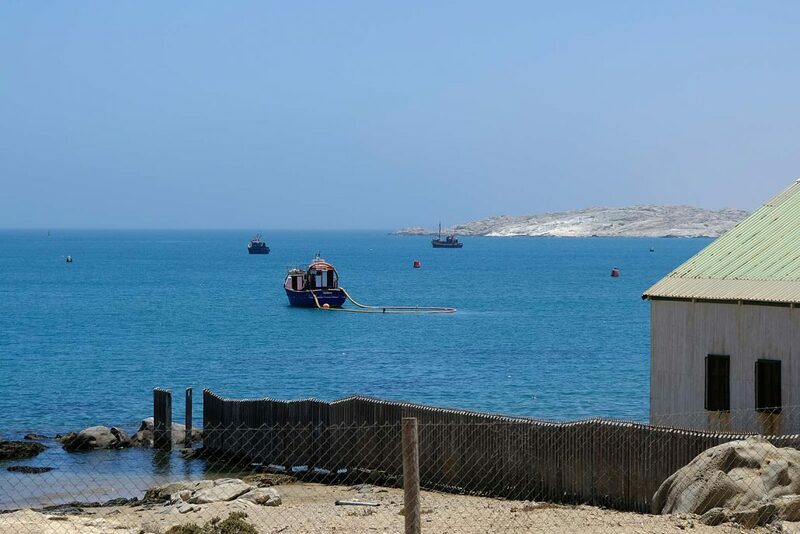 It is located 12 kilometres before Lüderitz in the diamond prohibited zone. 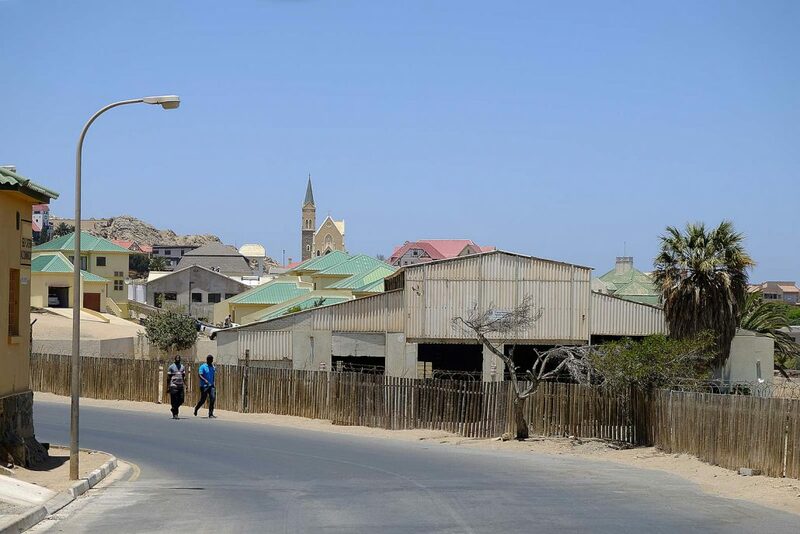 In 1930, when they closed down the mine, the once rich village withered until the last one switched off the light in 1957. 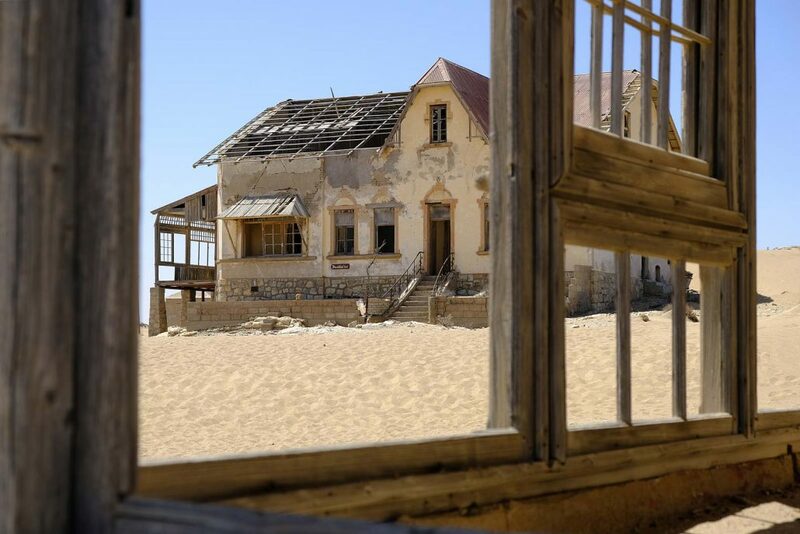 Since that time Kohlmannskuppe is a ghost town. 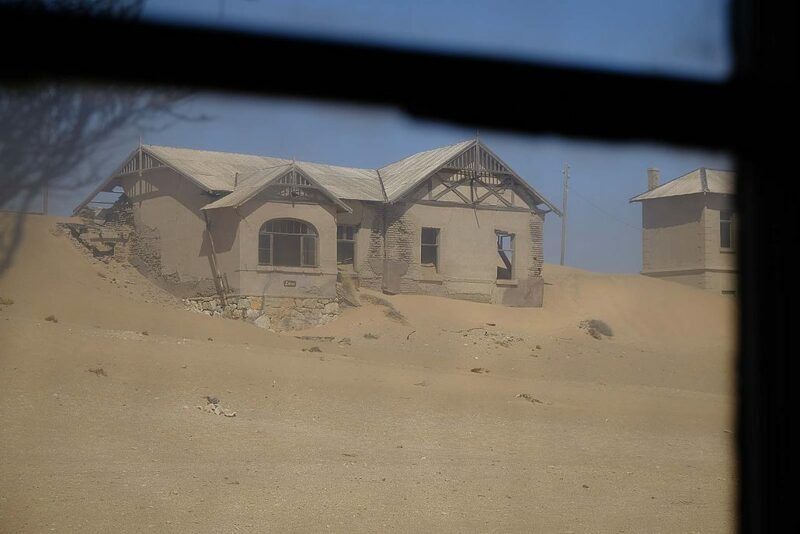 Long ago desert Namib moved in the ruined houses. 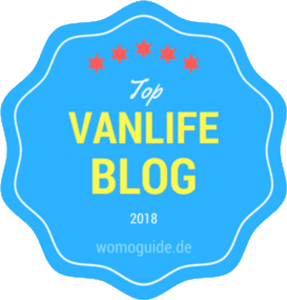 The guided tour through the village and the exhibition are very interesting and impressively illustrate how comfortable and innovative life in Kohlmannskuppe has been even at that time. 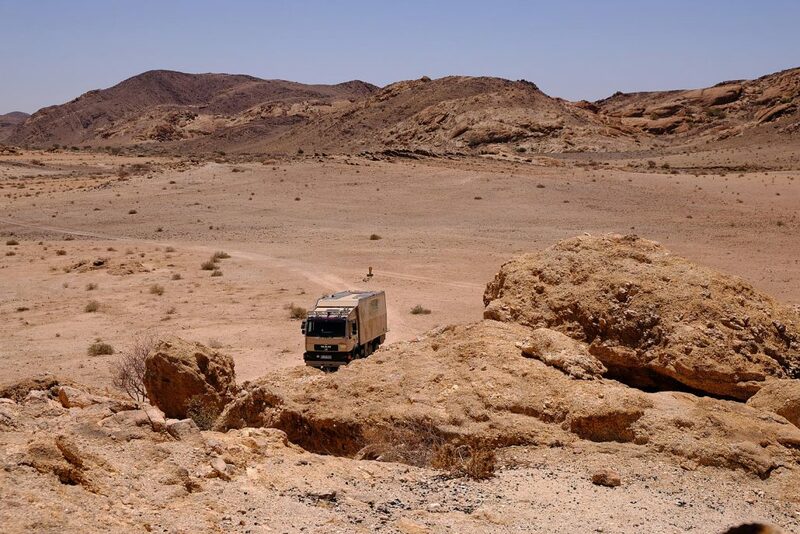 Every endeavour has been made to get everyday life as much comfortable as possible in that harsh environment and to warm up people for living in that sandy, stormy, meagre and hot area. The book keeper, the teacher, the architect, the quartermaster – they all had grand, well-spaced homes and palm trees in the front garden. The owner of the only shop was the richest woman in the village. Regularly she imported coveted food and other products from the German homeland to Kohlmannskuppe. There was a casino with a restaurant and a champagne bar, a bowling alley, a swimming pool with diving board and a theatre, where artists even from Europe came over to perform. Of course the bakery, the butchery and the hospital may not be waived. Ice cubes for the refrigerator, lemonade and soda were produced in the own ice factory and they had electricity and telephone. 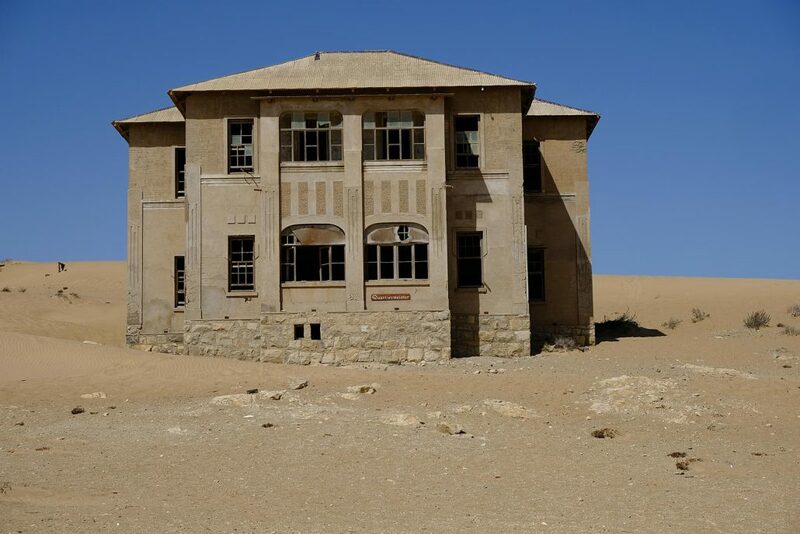 The diamond hunting workers had a dust-dry, rock-hard job and had to live far modestly in simple barracks. Temptations to lift a diamond they found were prevented by all available means. In advance we couldn’t imagine our visit of the dead village to be that lively. After all that fascinating history we try to cover quite distance. 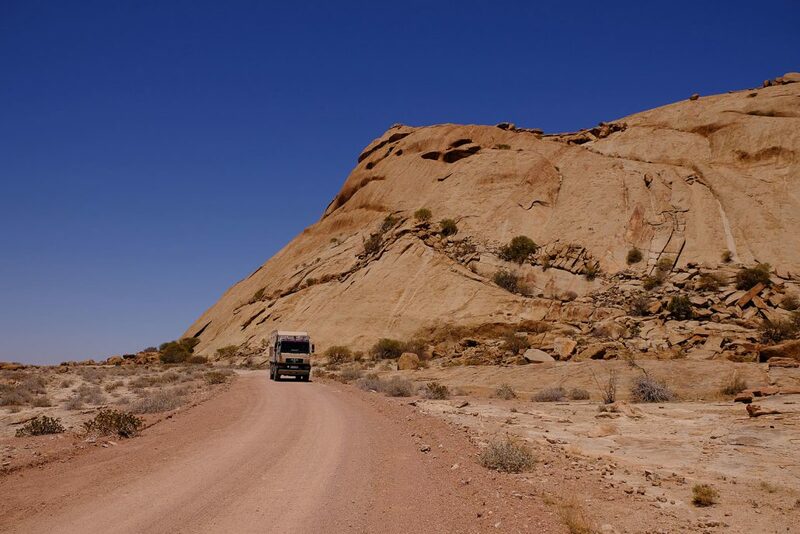 We are on pad C 707, one of the most beautiful scenic routes of Namibia, according to our guide book. 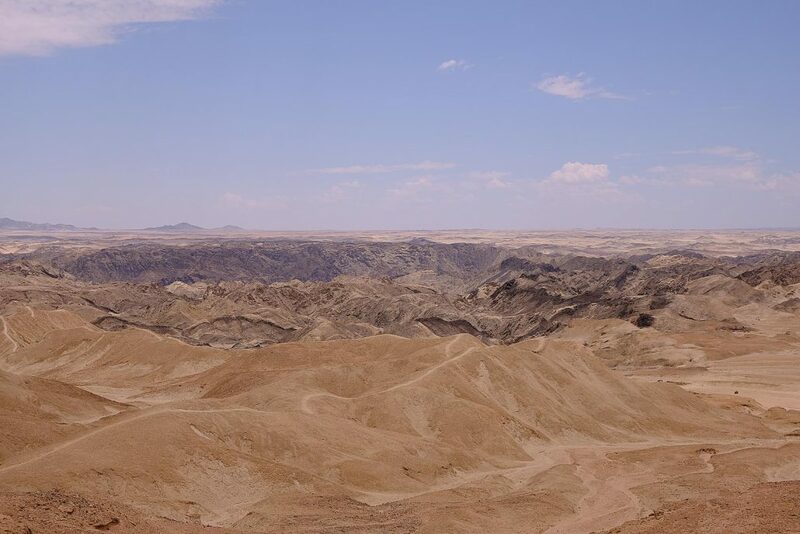 And indeed, marvelous panoramas appear in front of us. 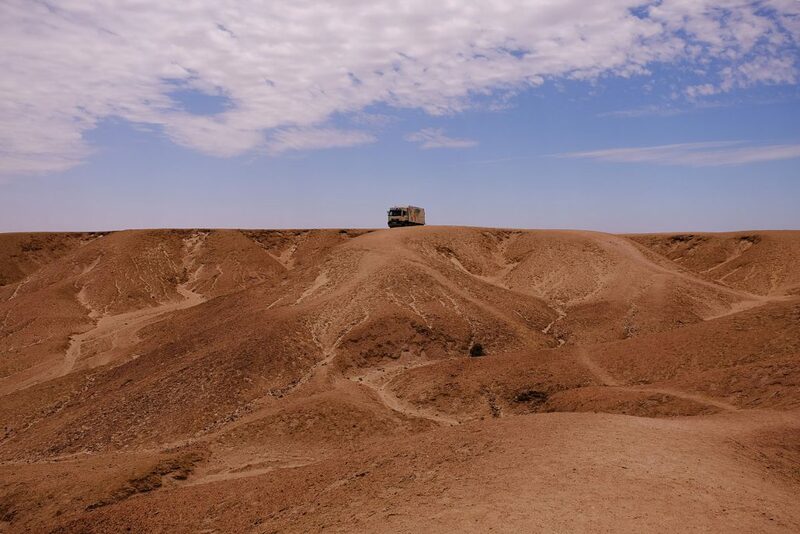 Not a moment to soon for our sundowner we can find our camp at the biosphere reserve Namtib. 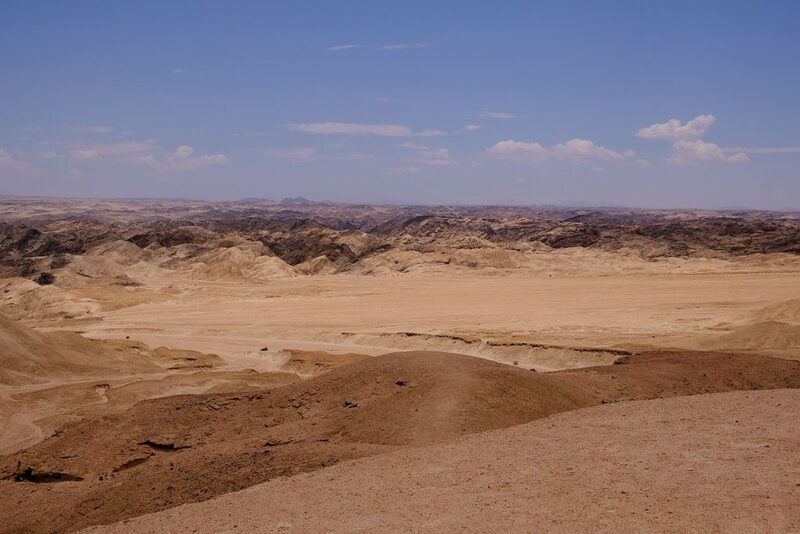 Dreamlike scenery, wide, red sandy spread of land, big enough for a small town, surrounded by red glowing mountains. It all is private farmland, for 35 years owned by the family, including the mountains. 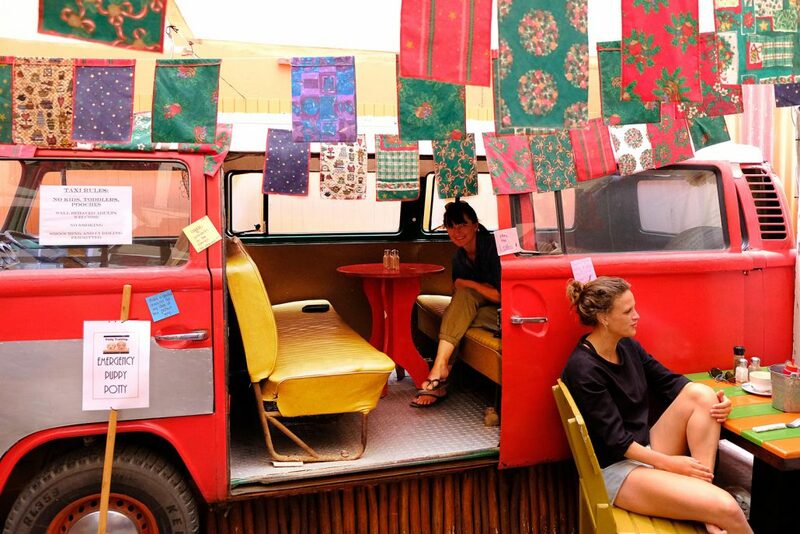 There are only five sites for campers. 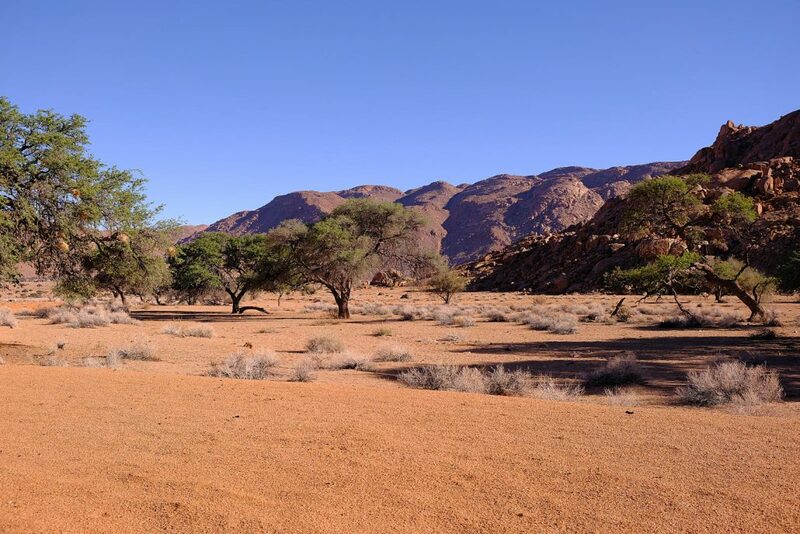 They are enormous, with shade giving trees, amidst impressive scenery and with a braai facility, of course. We are lucky to get one of the sites, even if it is only for one night. It is peak season and they are fully booked. Something else makes the place beautiful for us. We meet Helen and Dominik, expats from Germany, who live and work in Nigeria for more than two years. 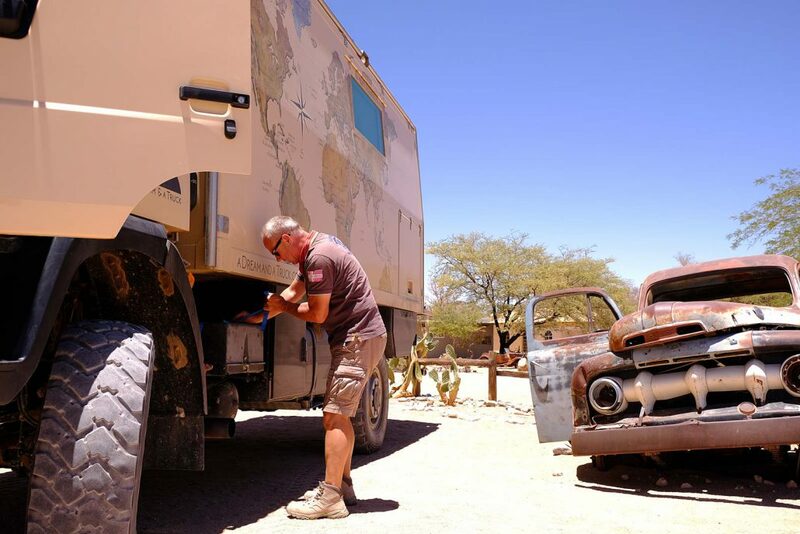 They read an interview with us published a while ago on travelbook.de and they saw our Truck at Kohlmannskuppe. That we now camp next to them is no longer a coincidence, Dominik is sure about. Together we have a wonderful relaxing evening with (of course) a camp fire, good wine(s) and an interesting talk. This won’t be our only joint evening, which we don’t know at that time. It is cosy warm, absolutely windless and very quiet. Millions of sparkling stars above. 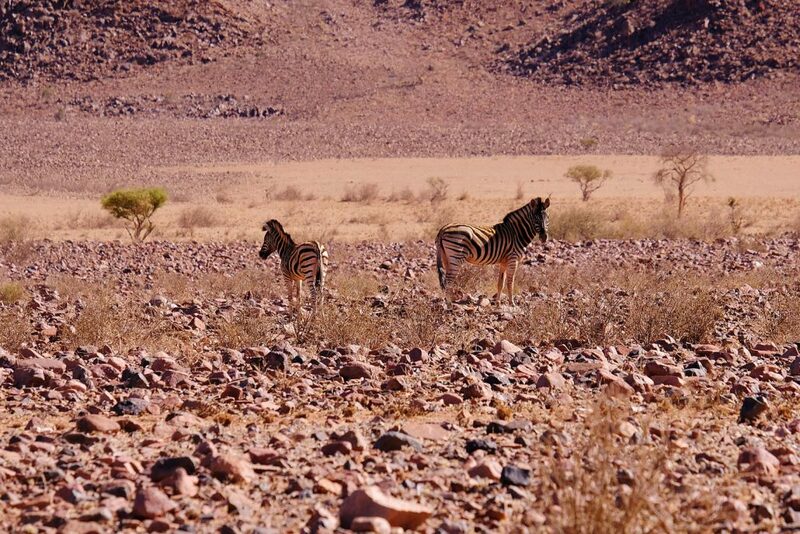 That’s Namibia at it’s best. 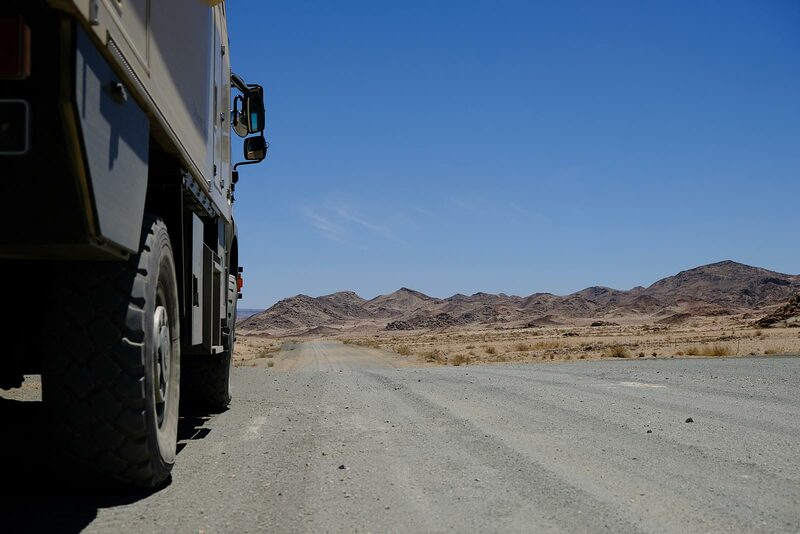 If we up to now thought South Africa is enormous and we have to take a lot of kilometres to travel from A to B – Namibia is the maximisation. 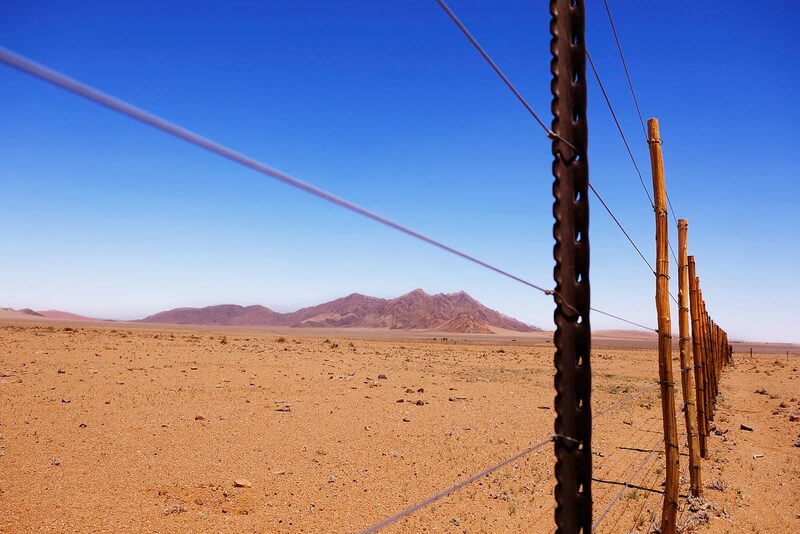 Kilometres of dead straight fences along the tracks make it almost impossible for us to turn into a corner anywhere and just camp for the night. We have to keep on going to the next farm or camp. 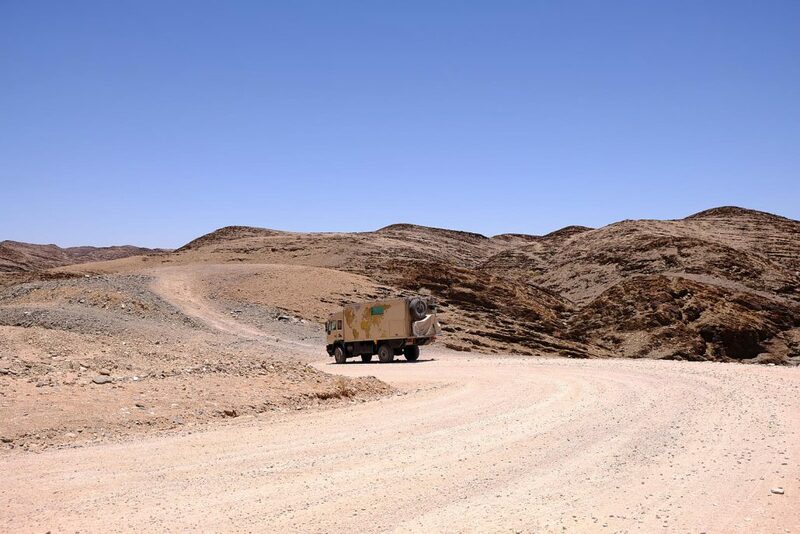 When touring on a 4×4 track we love to drive very slowly. 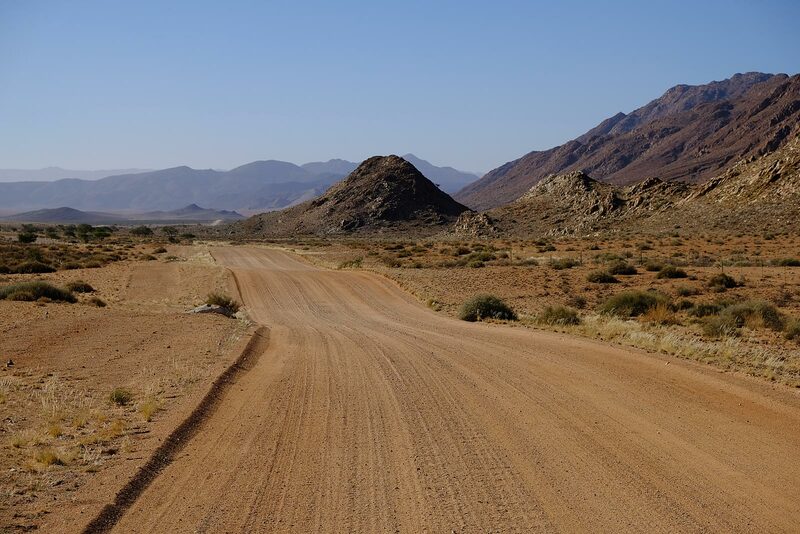 But crawling on dead straight endless gravel roads we feel outbraked, especially when roof-top-tented Land Rovers easily speed past us leaving just a dust cloud behind. We entertain doubts, if there isn’t any trick after all to go faster. But Conny & Tommy confirm from afar: Good things come to those who wait. It is the cozy summer nights under the stars with a nice camp fire that indemnify us many times over for the hard driving during the day. Perhaps it’s more due to the numerous shooting stars that fall from heaven every night. With each one I can make a wish by myself, which I appreciate very much. 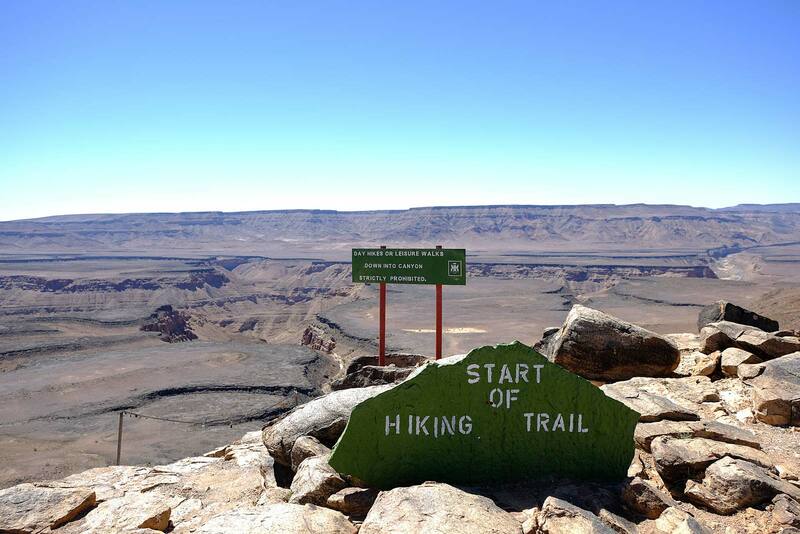 Fully recovered and with braced nerves we are fit again the next morning for another round of kilometres. 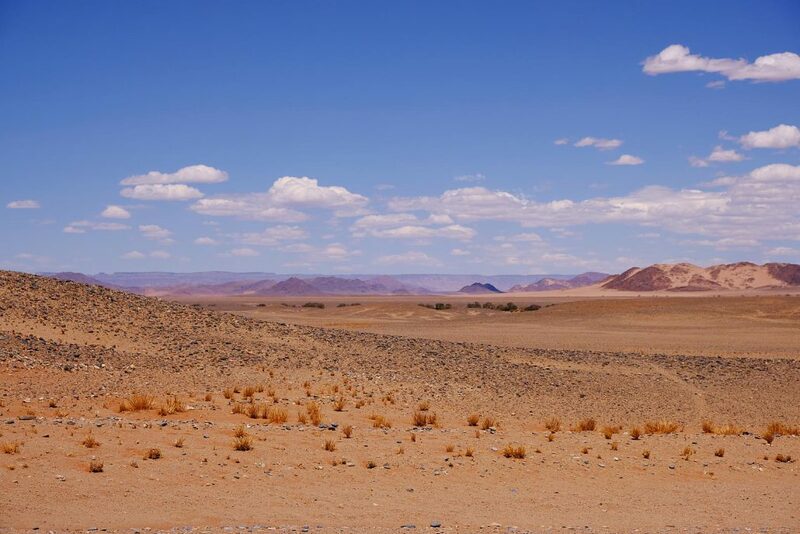 At Namib-Naukluft we experience a nature cinema of superlatives. 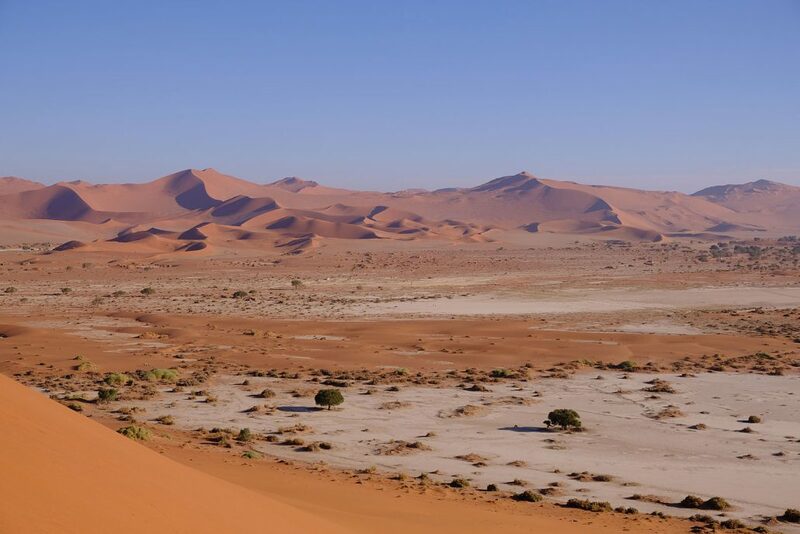 With an area of 49,768 km² Namib-Naukluft is the largest nature reserve of Namibia. 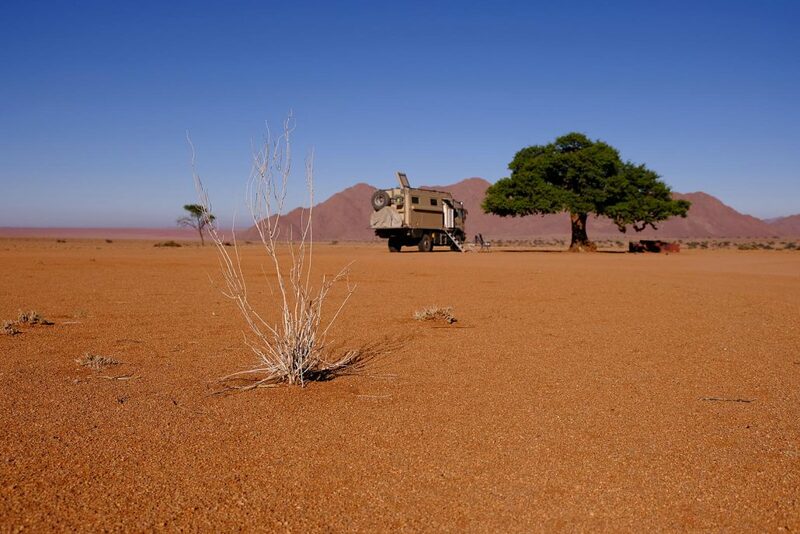 Namib is round about 80 million years old and the oldest desert of the world. 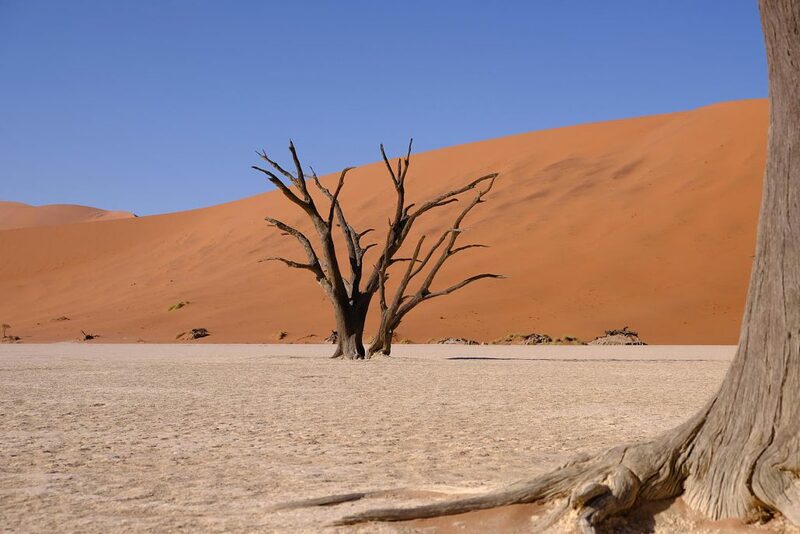 Sossusvlei, a big pan of salt and clay located in the Namib, is surrounded by red sand dunes, which are up to 300 metres high. 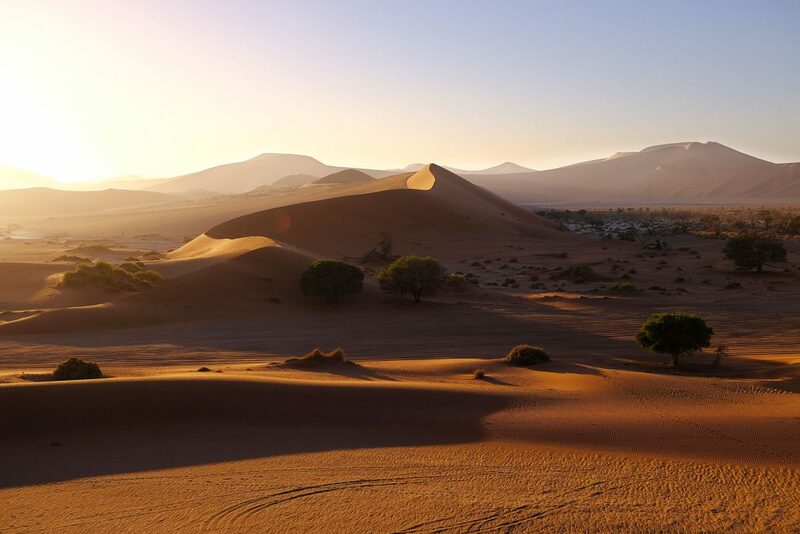 They are considered to be one of the highest sand dunes in the world. To visit Sossusvlei we left early in the morning at five o’clock with quite a number of other visitors, to catch the early morning light in the dunes. In the morning and in the evening the variations of colours, light and shade is the most enchanting. 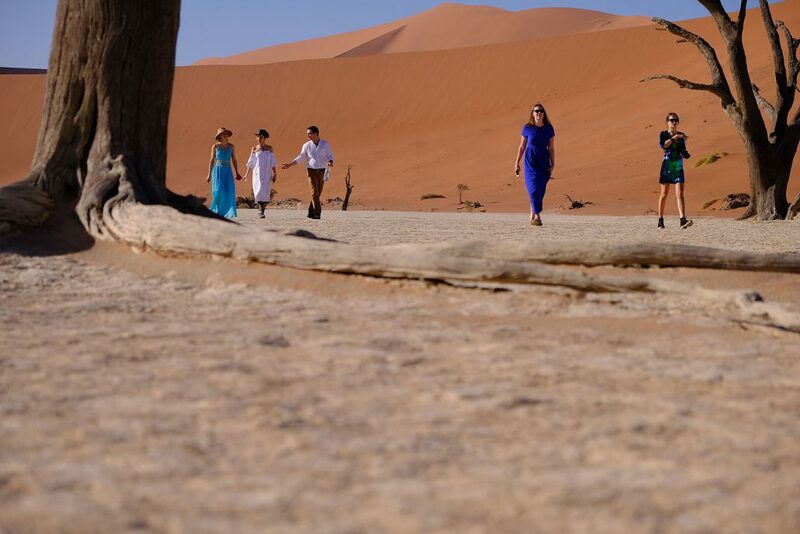 Now it is delightful chilly and perfect for climbing the dunes. At 11 o’clock already temperature will climb up to 30 °C and in the afternoon even up to 45 °C. 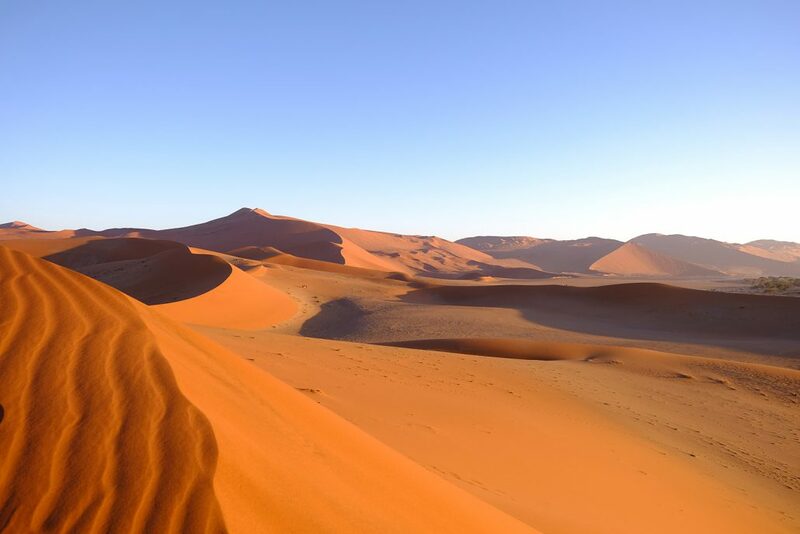 Indescribably beautiful colours appear on the huge sand dunes in the first light, all facets of pale yellow and pink to vibrant red brown, cool purple and blue, in between the dark green of desert shrubs and bushes. 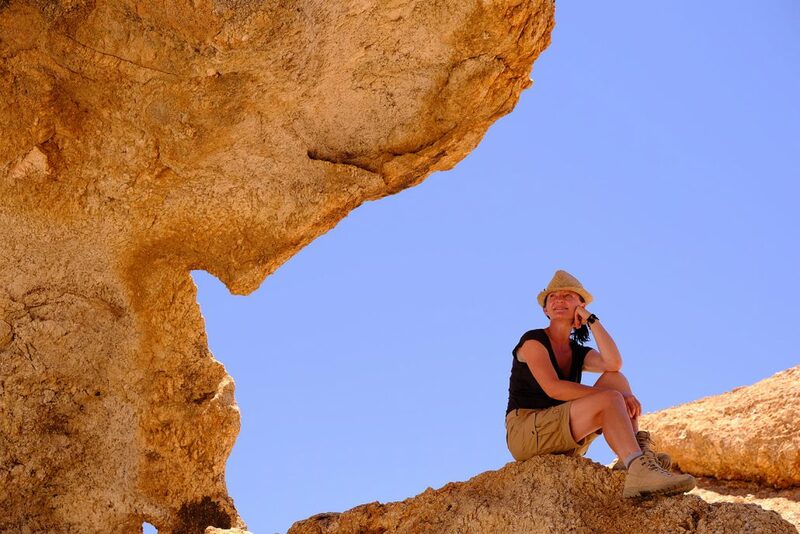 We trudge up through soft sand on the ridge of a dune to the top and get a smashing view. Continuously the stunning scenery changes under the light of the rising sun. 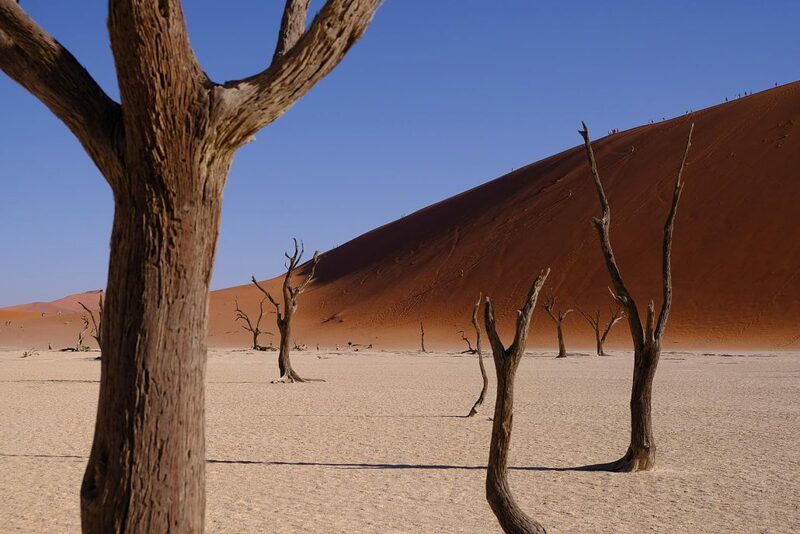 In the Dead Vlei the bizarre scene of a tree cemetery comes into our sight. 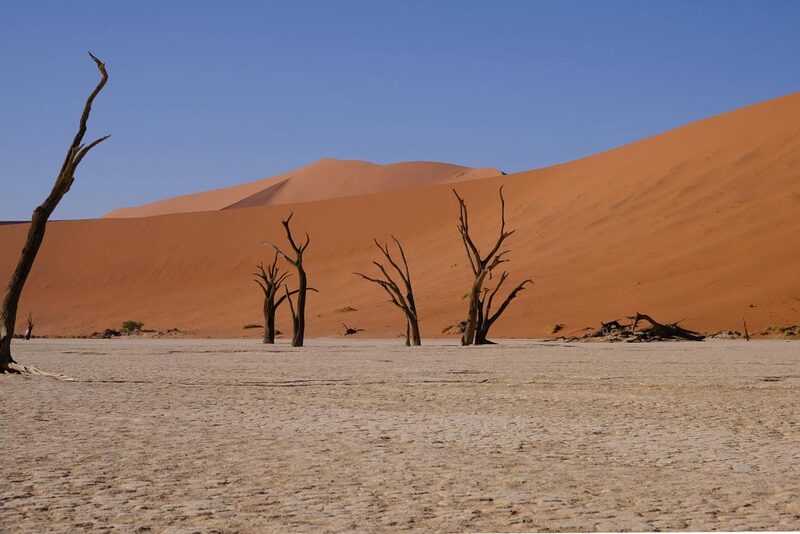 Grey dead trees spread on a white carpet of dry clay in front of glowing red sand giants under the deep blue sky. It feels like strolling through a big open air art gallery. Even this insensate state doesn’t minimize the fascinating grace and strength of the dead remnants of the trees. Of course we are not the only ones here, everybody else is there too. 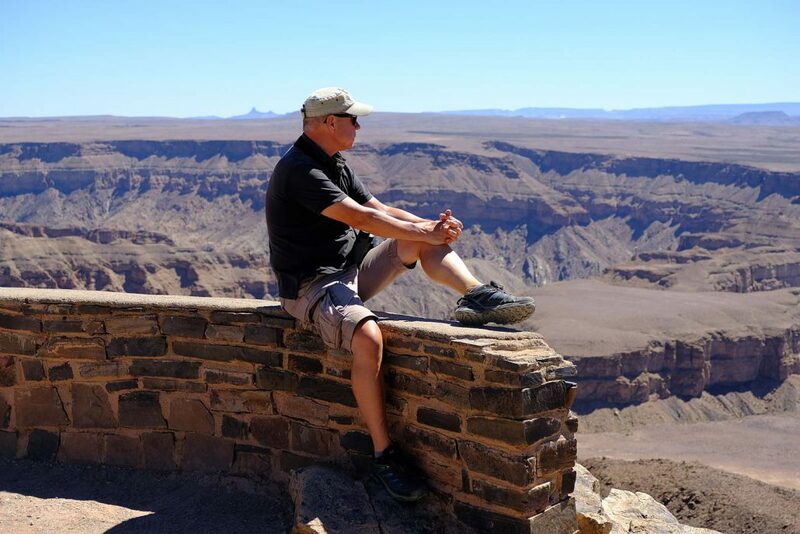 Even so the spot is quiet and feels very special – like a museum. We are very happy to experience it firsthand. 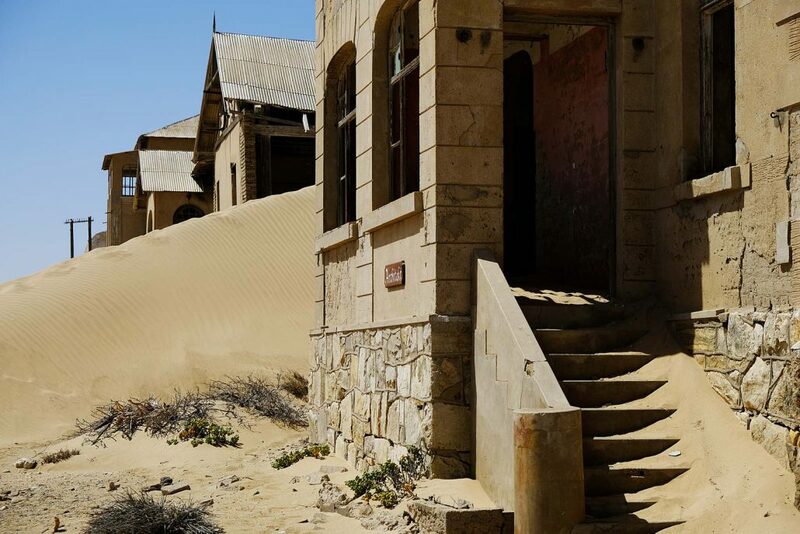 Is this the magic of Namibia? 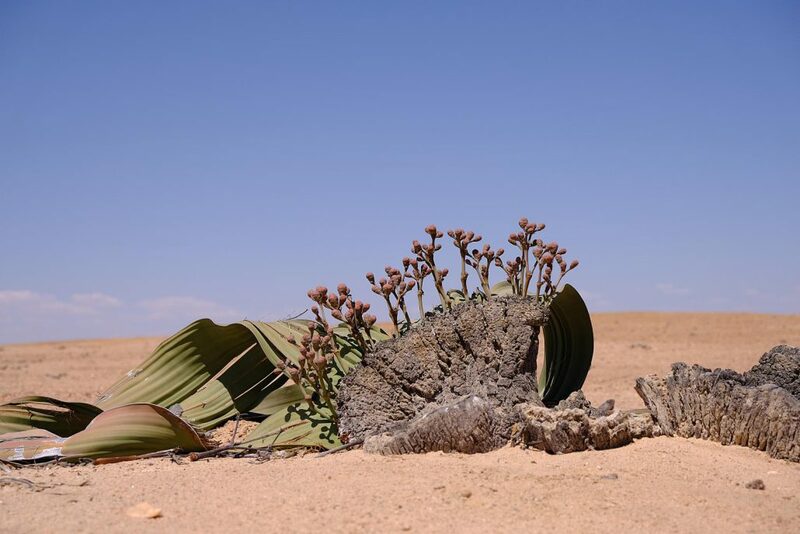 The nature of oases is, that they appear where you don’t expect but strongly wish for them. 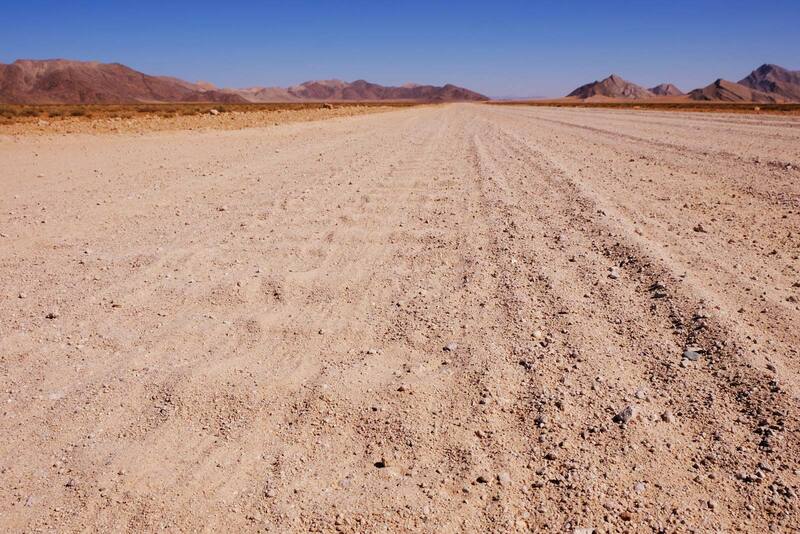 This phenomenon can also be found in Namibia. 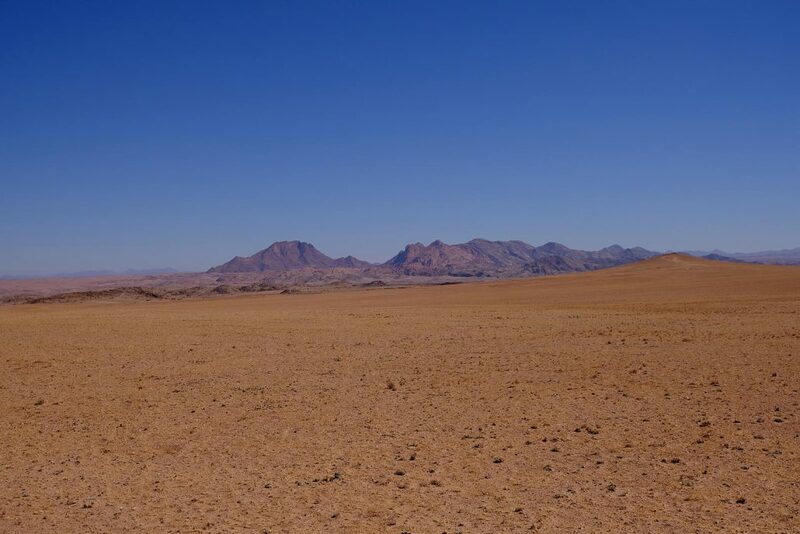 Solitaire is an oasis like this. 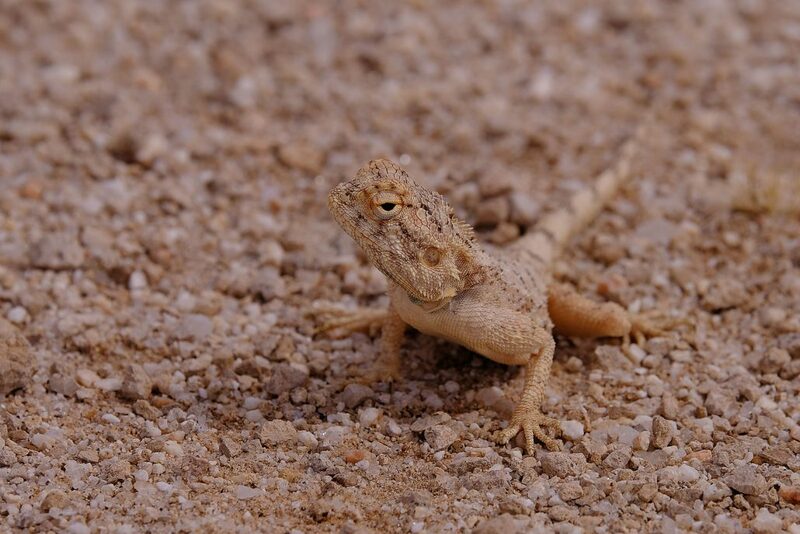 Unexpectedly it shows up by the track in the glowing desert. 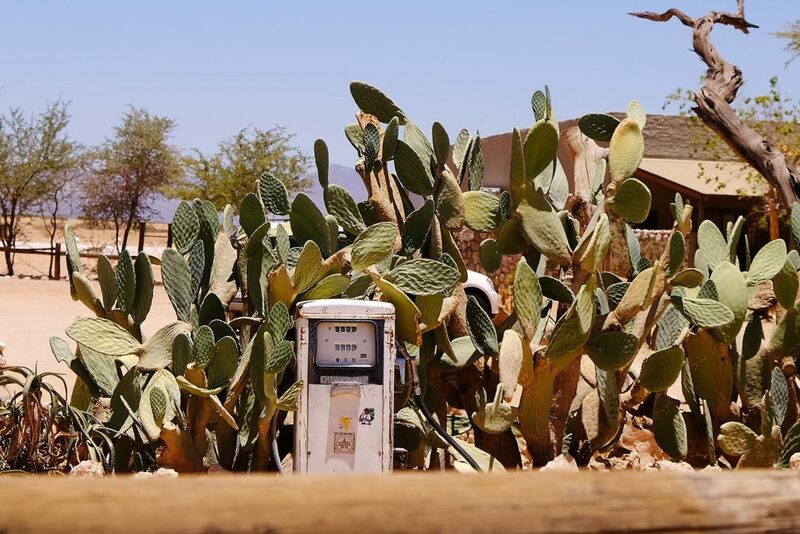 There is a petrol station with tyre service (very important! ), a lodge with camp ground and Mc Gregor’s Bakery and it’s popular to-die-for Apfelstrudel (very important, too!). 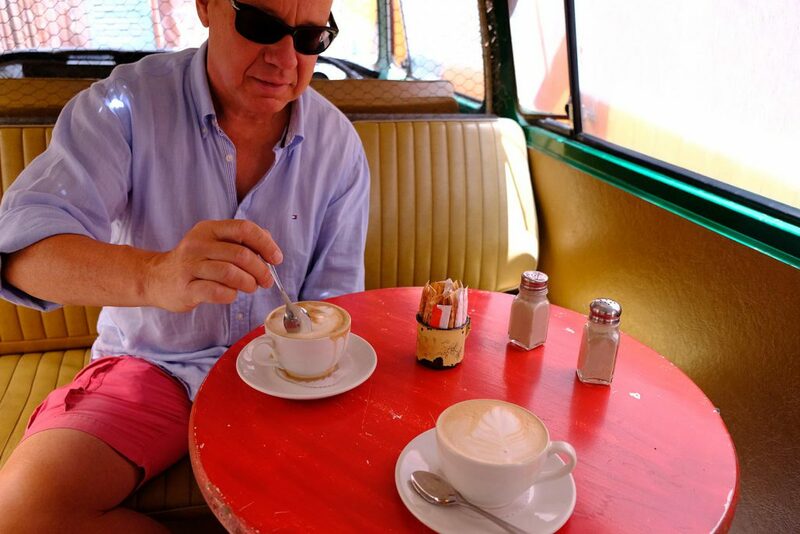 A refuelling stop here is cult and a must on each tour. So it’s not a pure coincidence that we happily have coffee with Henning, Birgit, Anne, Rieke and Joseph at Mc Gregor’s Bakery. The last days we met the jolly five from time to time on the route. 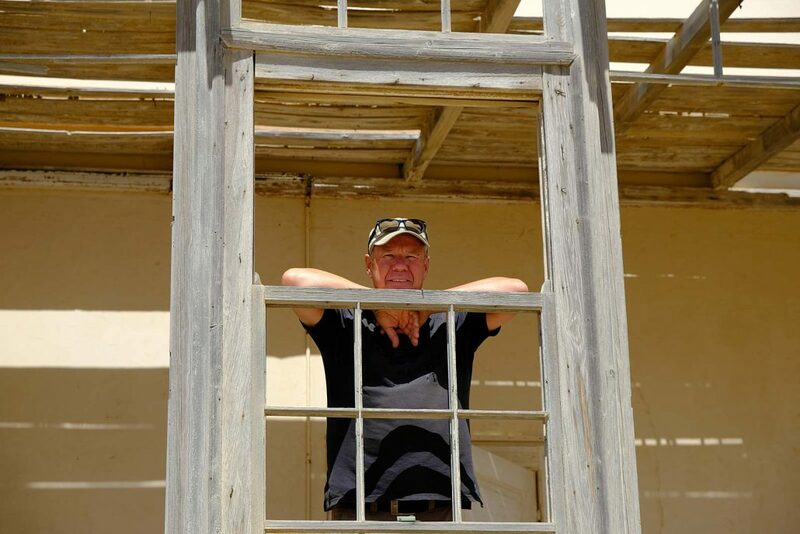 The first time was at Christmas at the hot springs of Ai-Ais, later on in Lüderitz and at Sesriem Sossusvlei and now here in Solitaire. And we will meet them once again in Windhoek. How wonderful! 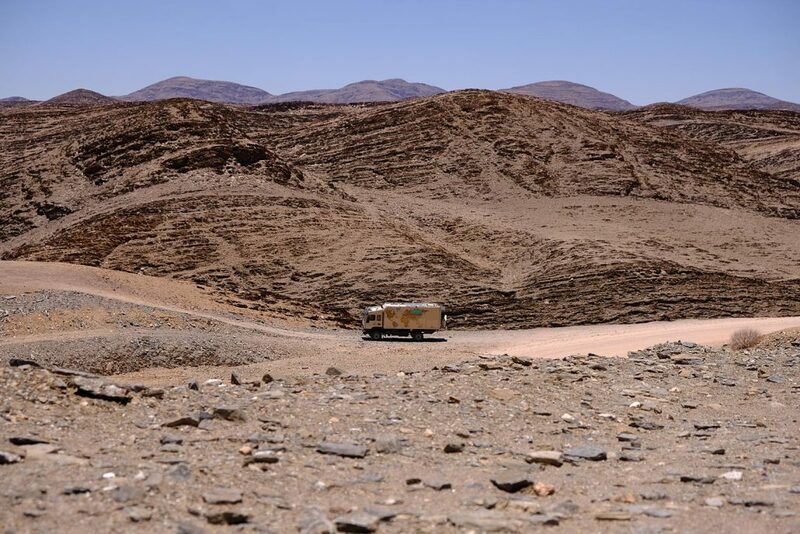 By the way we discovered an new possibility to turn our rides on annoying corrugated gravel tracks into a joyful trip. 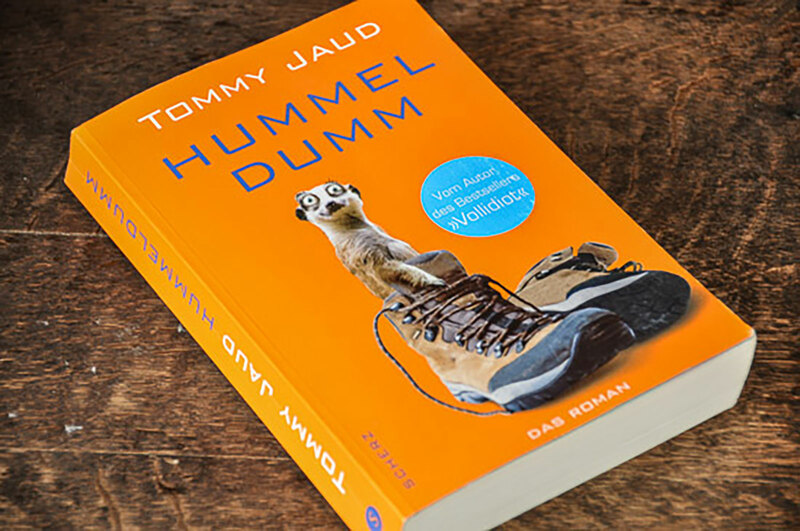 I read Win and me the novel Hummeldumm by Tommy Jaud. 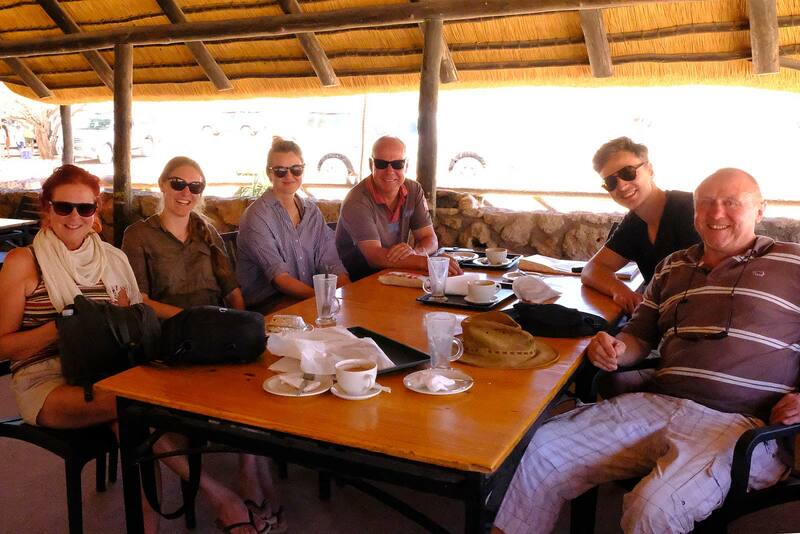 A tour group of nine Germans suffer a 14 days round trip through Namibia together with their Namibian tour guide Bahee. There is a lot to laugh about due to the fact that many locations and situations of the inhomogeneous group sound very familiar to us. 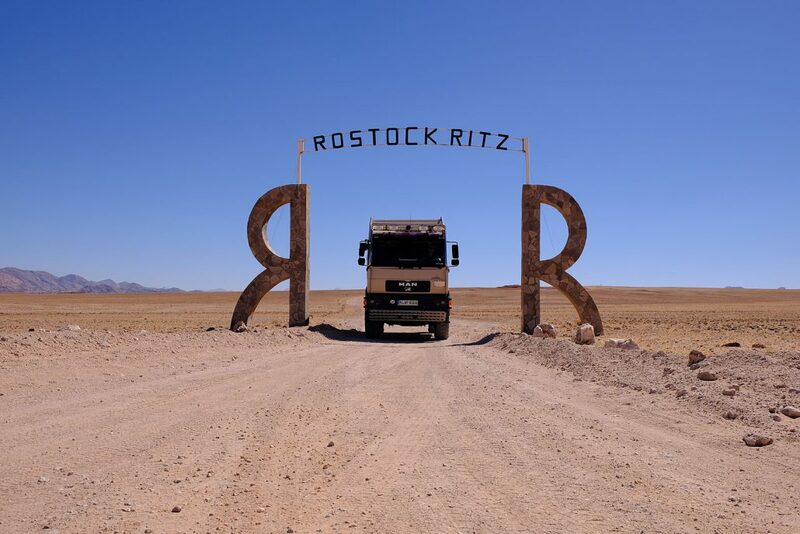 It takes us some hours of reading to survive the 200 kilometres on pad C 14 from Rostock Ritz Lodge, where we join our own invitation for New Year’s Eve dinner, to Swakopmund. 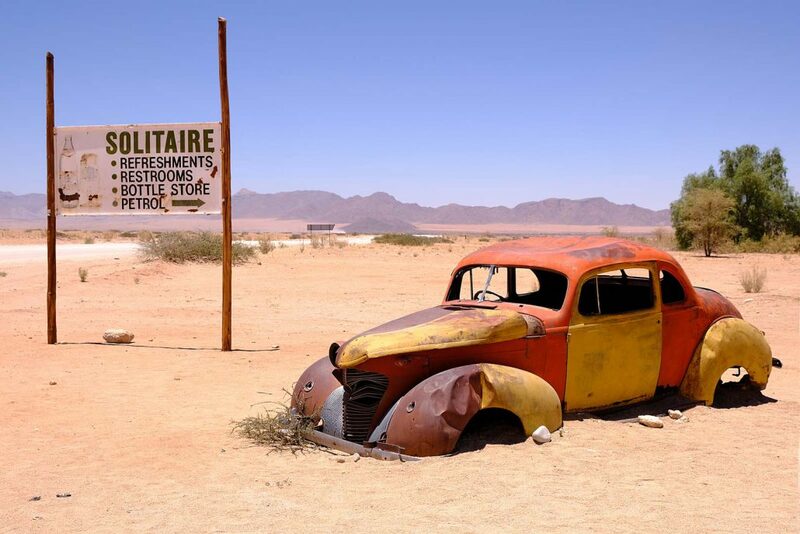 It’s a very scenic route, no doubt. 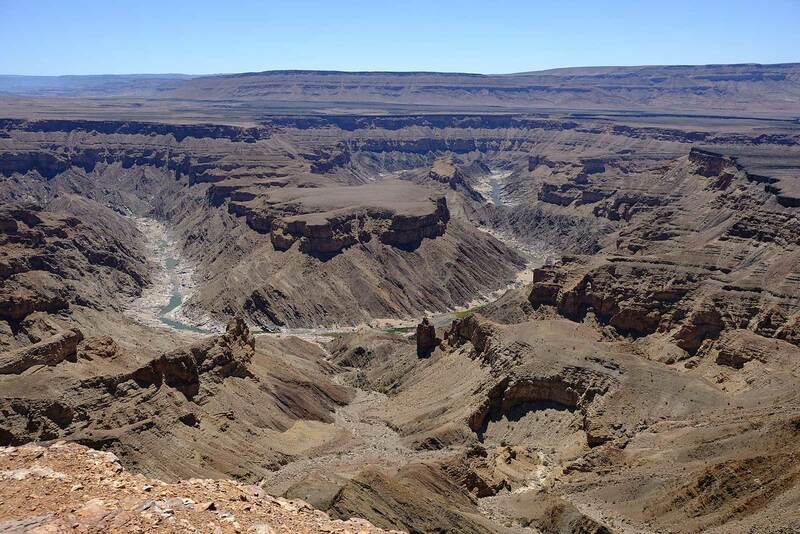 The pity is that we missed to buy a permit at Sesriem which allows us to camp off the C14 at Namib-Naukluft Park on one of the nature camps or to take a look at Kuiseb Canyon. 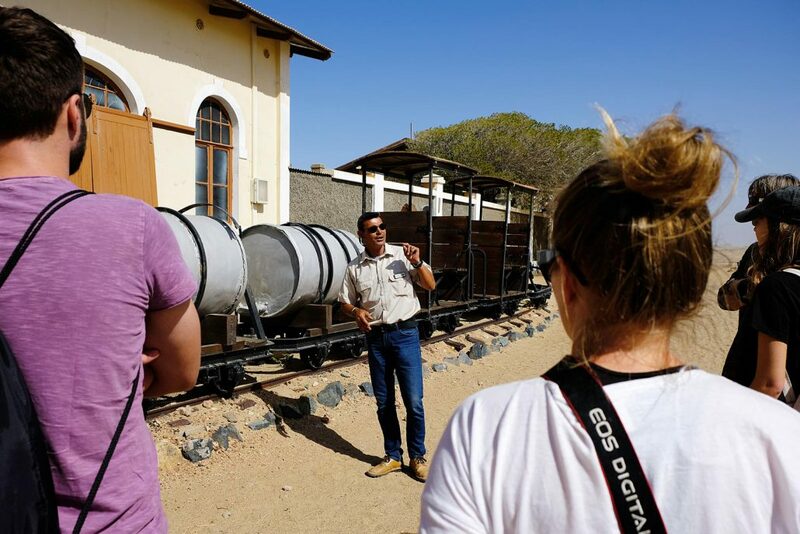 Although Conny & Tommy and also our guide book explained several times before, that a permit is required and it only can be bought at Sesriem, Swakopmund or Windhoek, we obviously were too slow on the uptake. 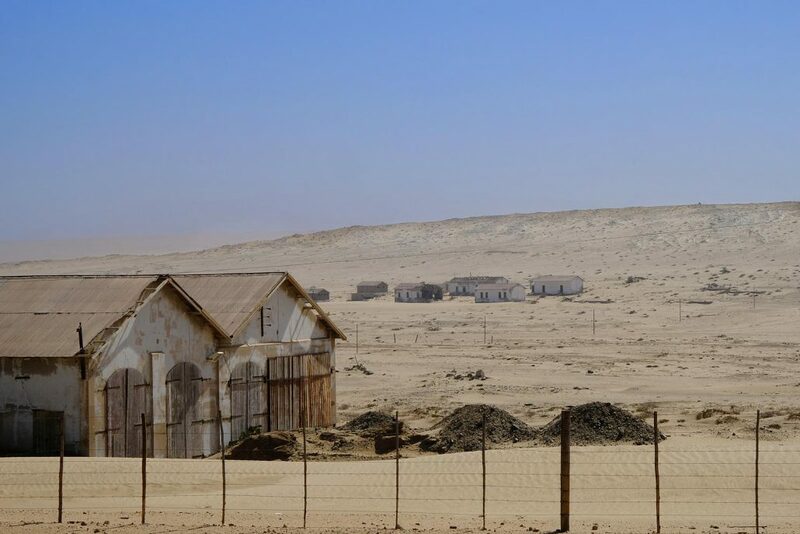 We get it in the middle of pad C 14 and now have to go through to Swakopmund. It*s „hummeldumm“ but we make it. 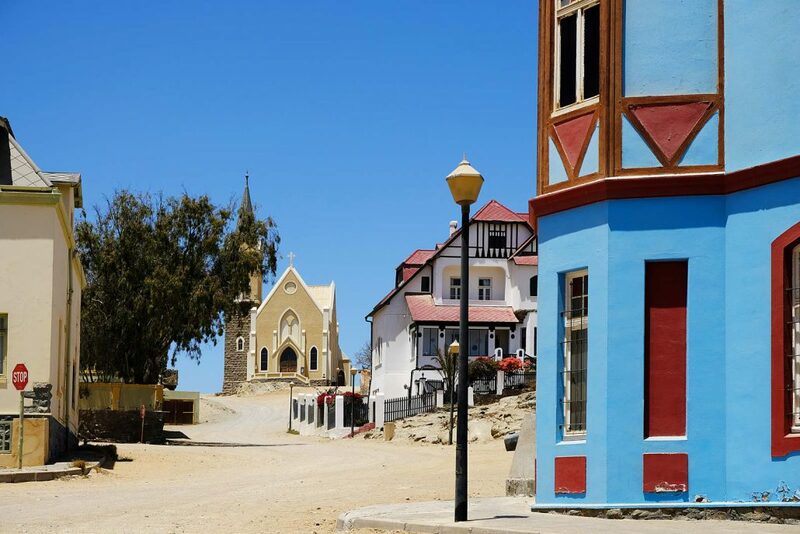 We feel a little bit like visiting a German seaside resort at the Baltic Sea when we stroll through the streets of Swakopmund the next morning. 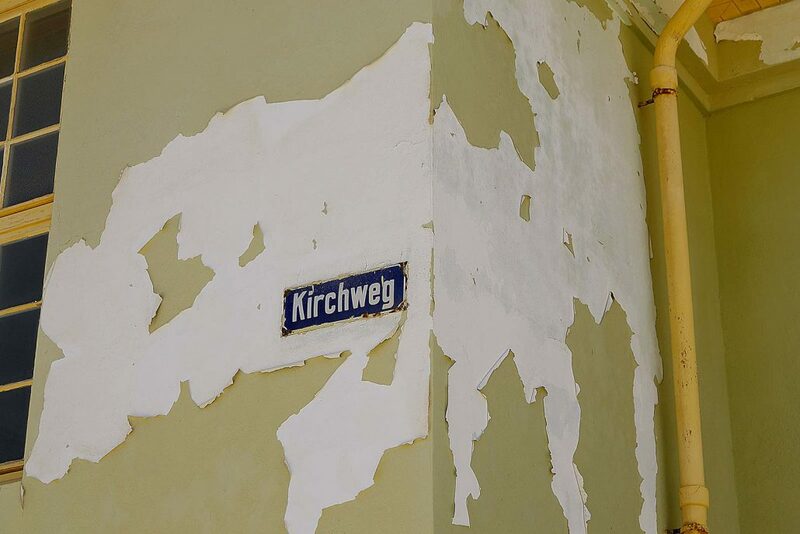 On every corner we come across traces of the former German colonial time. You can get Schwarzwälder Kirschtorte, streets often have German names, in the shops they talk German and close at 5.30 p.m. – traditional German opening hours in the old days. 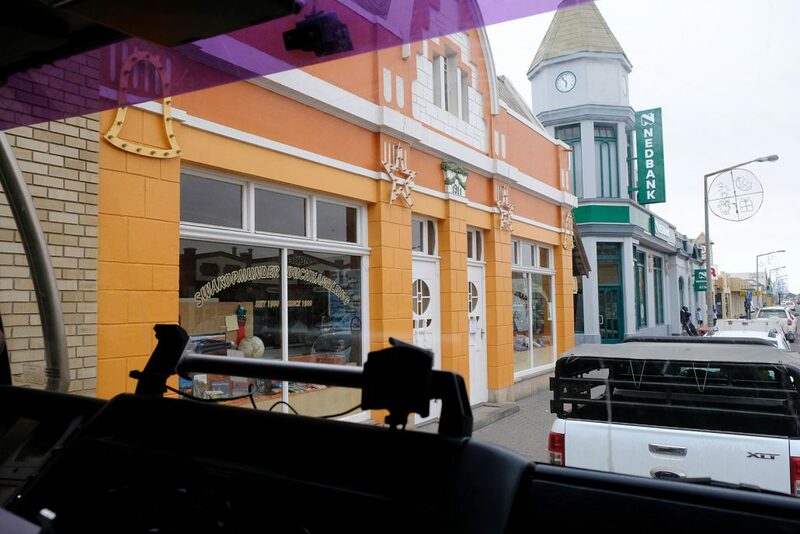 It precisely is the touch of soundness that makes up the charm and cosy atmosphere of the little town. 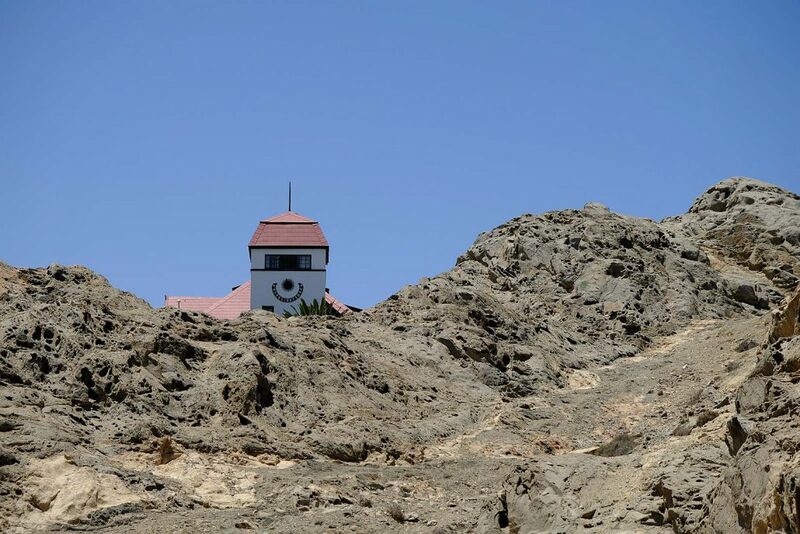 On the other hand Swakopmund means to be a land of milk and honey for it’s inhabitants and Namibia tourists. 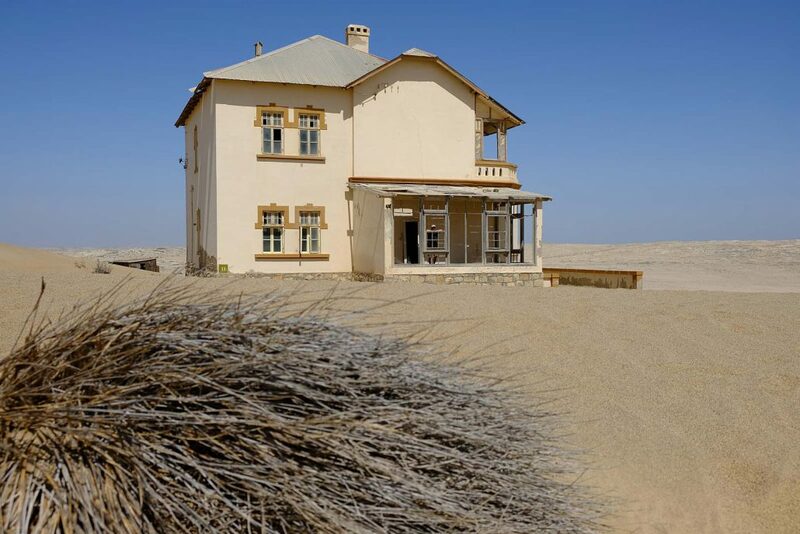 Someone, who managed touring hundreds of kilometres through the desert or lives on a farm hundreds of kilometres far away, can get everything the heart desires at Swakopmund. 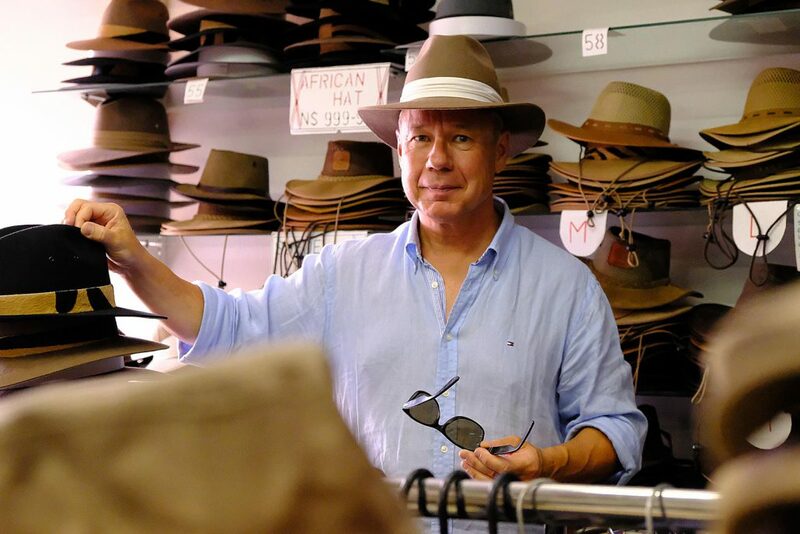 Shops, restaurants, craft breweries, food, tyre services, souvenirs, safari clothes, car service stations, electrical goods, home accessories – absolutely everything. 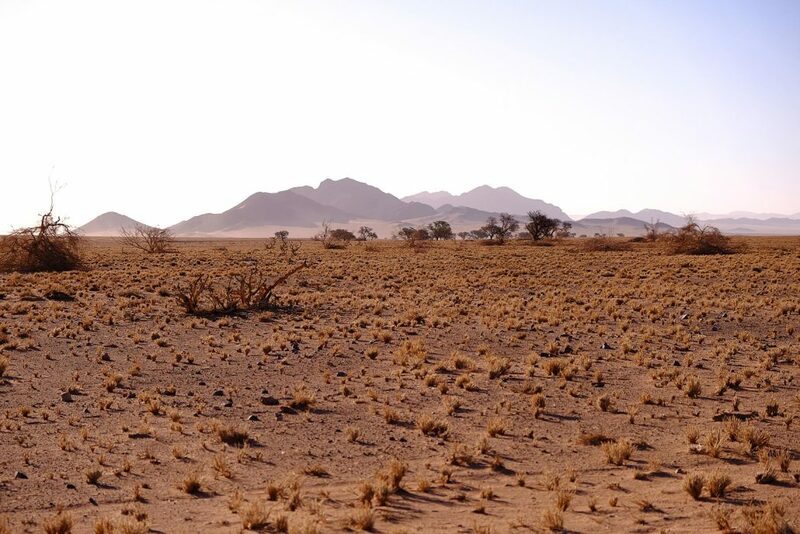 The next opportunity for shopping is Windhoek, 340 kilometres far away. 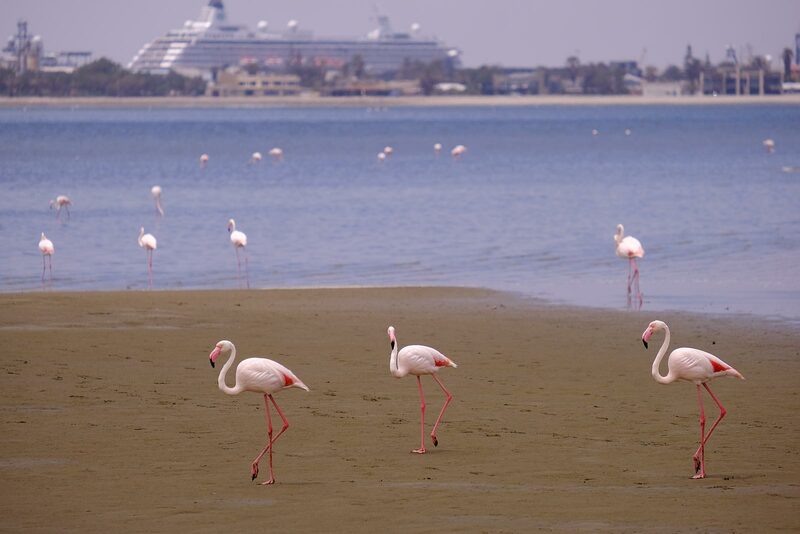 So we take the chance to get some stuff for our truck, drink cappuccino in an VW Bulli, to try on safari hats and to watch flamingos at Walvis Bay. 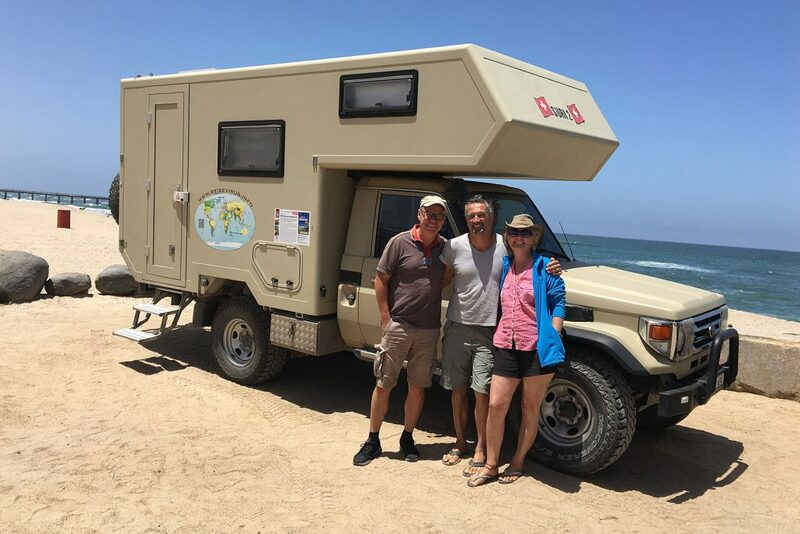 After we’ve met again Helen and Dominik at Soussusvlei and later on our route to Solitaire, the petrol station in the desert, there is no doubt about having dinner together tonight when we come across the two while shopping in Swakopmund. We love to talk to each other and we enjoy being together. Our group is completed during the evening when Conny & Tommy and long-term travelers Ruth and Walter from Switzerland join us. That’ s how we like it. To be on a journey means to be flexible. We are flexible and that’s why we will take a plane from Windhoek to Nuremberg. We have to fly home for a little while to get some housekeeping matters done. The advantage is that we can meet family and friends again. 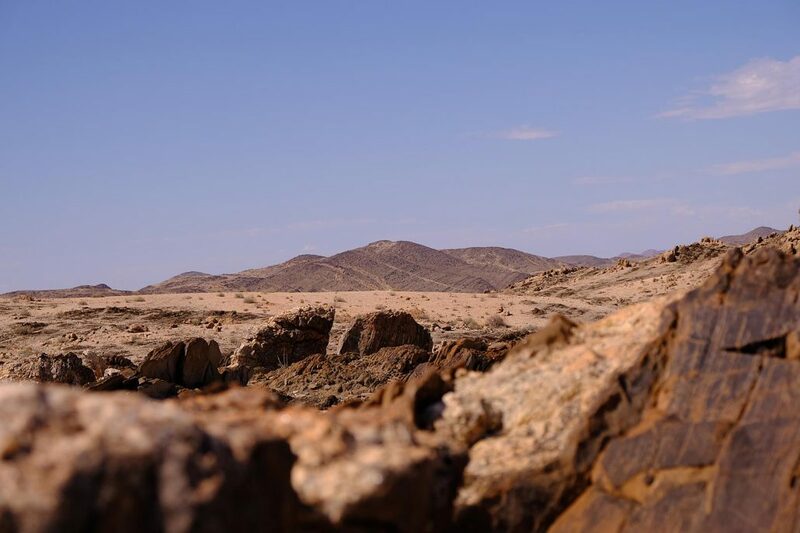 In two or three weeks we will come back to Windhoek and move on with our journey. 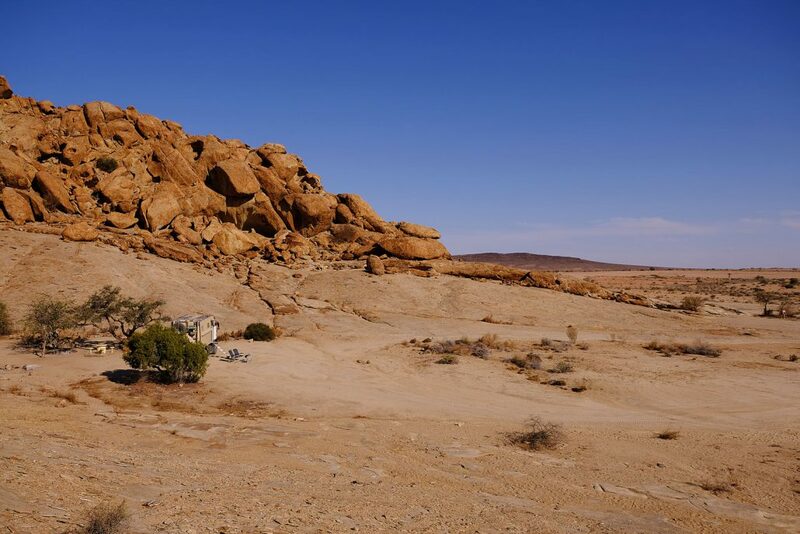 But first we are lucky to have a look at Moon Landscape and mysterious Welwitschias at Namib-Naukluft Park, enjoy lonesome nights at Bloedkoppie and Tinkas Camp, admire Rock Arch and stroll through beautiful desert landscapes of rocks and sand. No kilometres of fences, that force us on the track, but wide landscapes ready to touch. We are in the middle of nature instead of riding past. We feel a little bit disconnected from earth, indeed, when strolling through Moon Landscape. 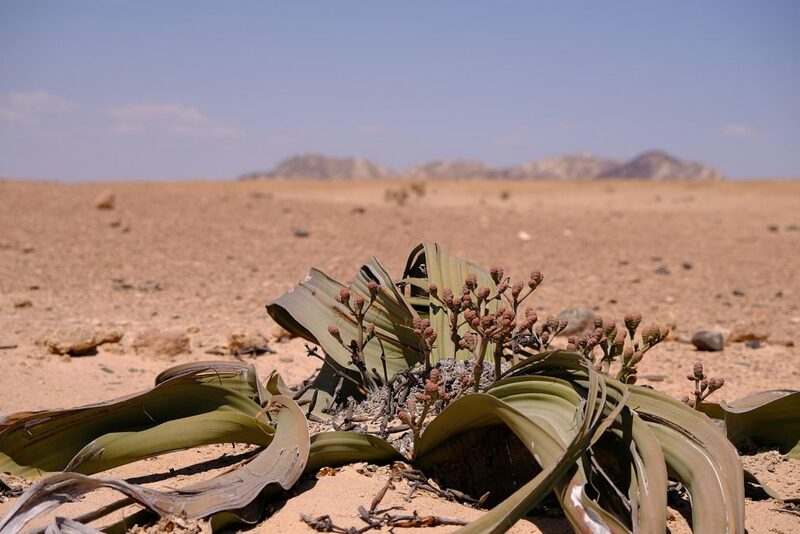 A unique plant of strange beauty is Welwitschia, endemic in Namib and able to get very old. 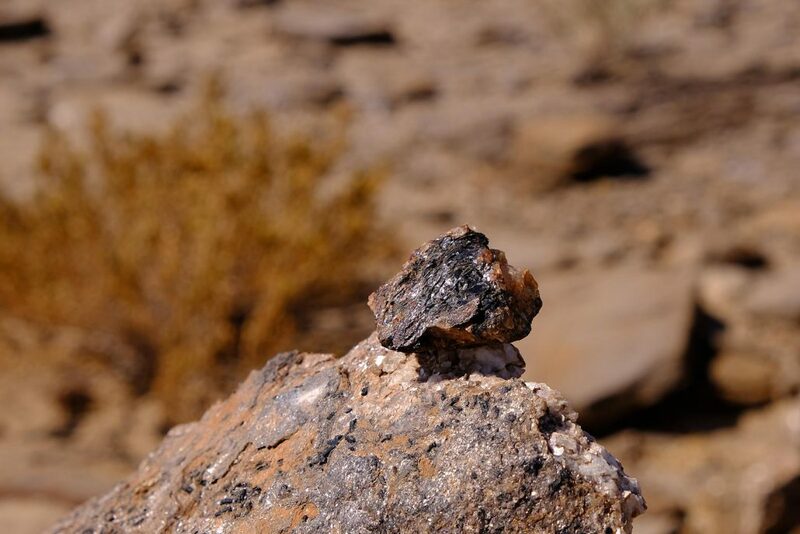 The age of single specimens is estimated at 1,500 and even 2,000 years. 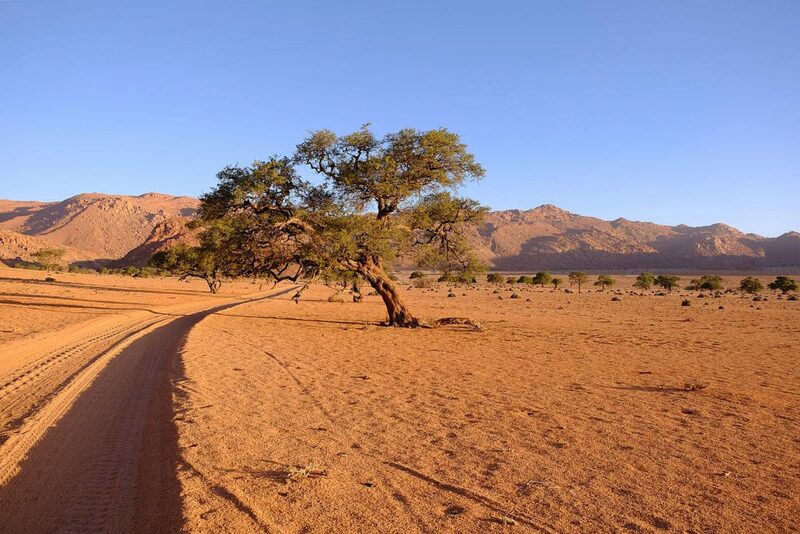 Hot desert days and starlit nights in total solitude at Bloedkoppie – that’s very special. 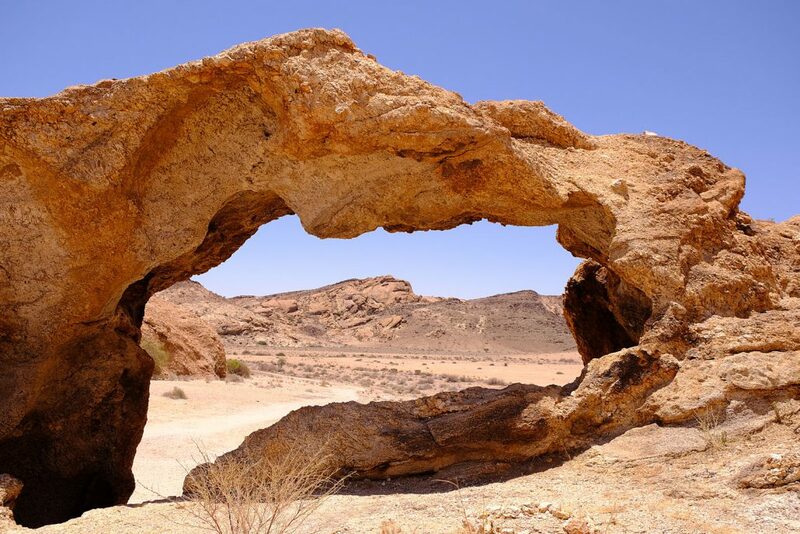 We are astonished at the area around Rock Arch where we can see many unique and extraordinary formations of stone created by nature. I just drove past you in Sam Nujoma Avenue, Windhoek. Both of you smiling from ear to ear…this made my day as a taxi driver in front of me just started to get on my nerves (everyday Windhoek). Seems like you already had an amazing trip this far. 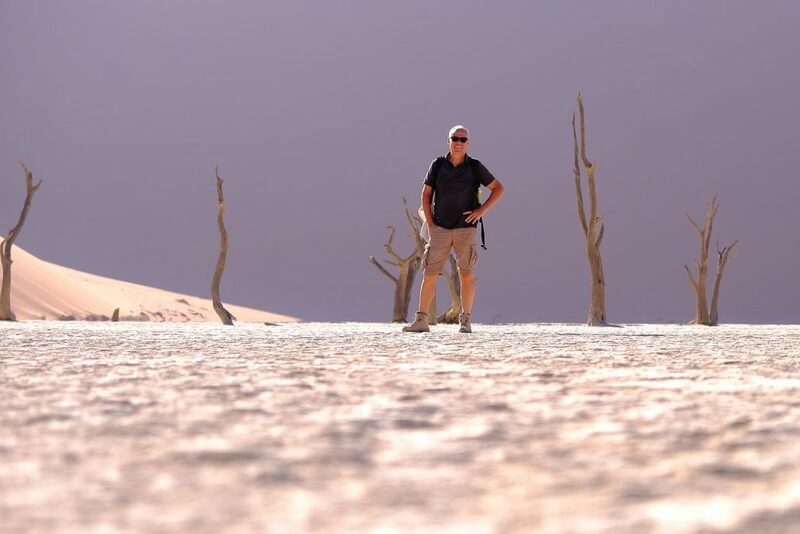 Best wishes for the remainder of your trip, travel safe and enjoy the solitude of Namibia. what a nice surprise to get your message. You “made our day“ with it, too. Thank you so much. 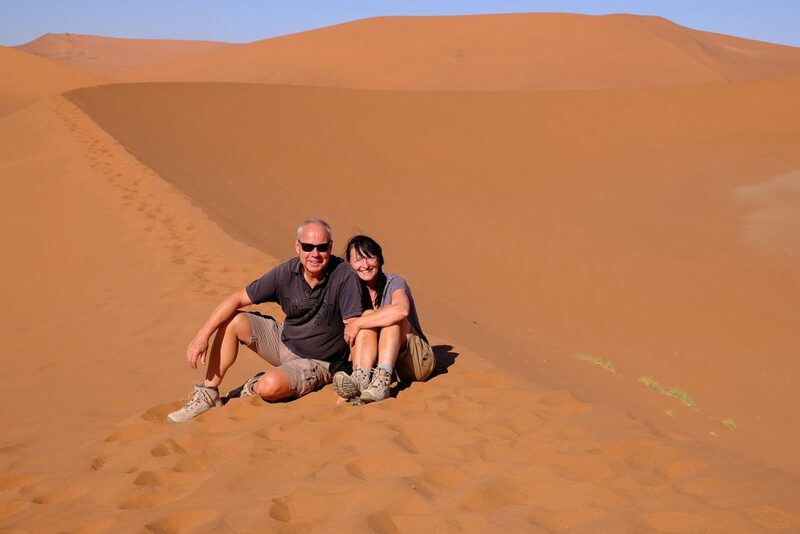 Exploring Namibia is a fantastic experience for us and we enjoy it very much. 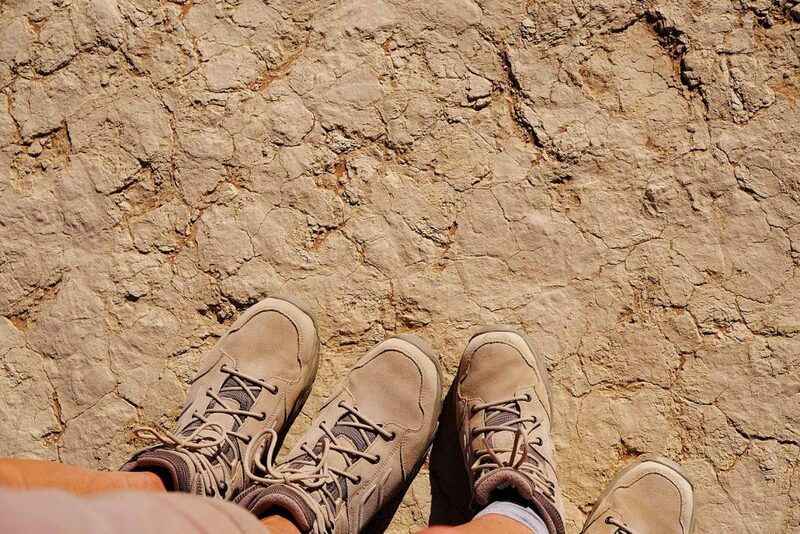 And yes, in particular it is the solitude and the amazing landscapes that won our hearts.